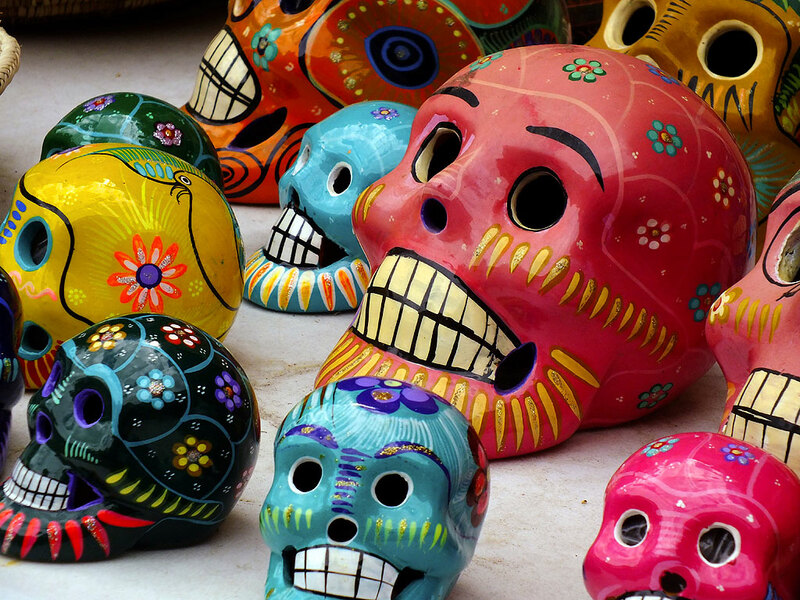 Traditional New Mexican painted skull art sits on display in a shop in Santa Fe’s historic Plaza. 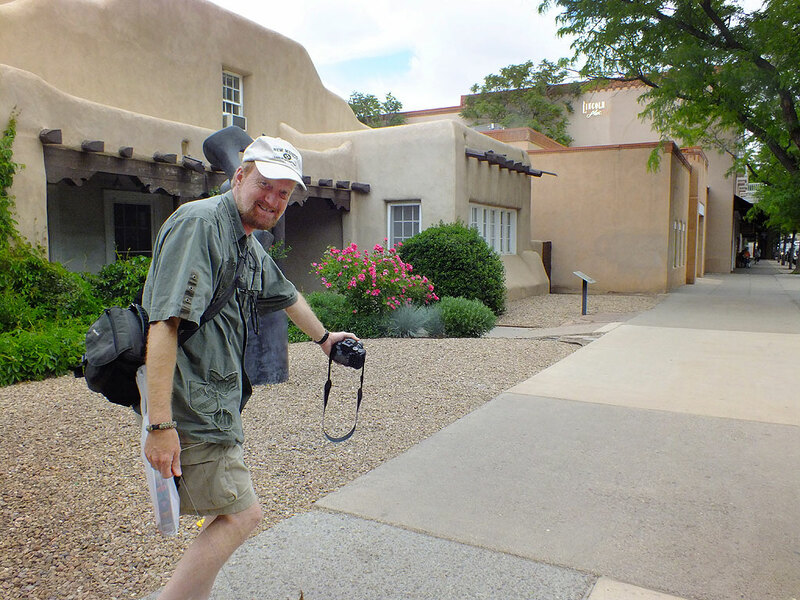 As my wife Abby and I planned this vacation, we kept saying, “Santa Fe getaway.” It is one of our favorite places for both local attractions and as a base camp to adventure. Abby and were in a great mood and happy to be on the open road together for the first time since our tenth anniversary trip in October 2014. We shared the sights, great conversation, and one laugh after another. The dogs, our Chihuahuas Max and Sierra, seemed perfectly happy curled up on their back seat dog cover. 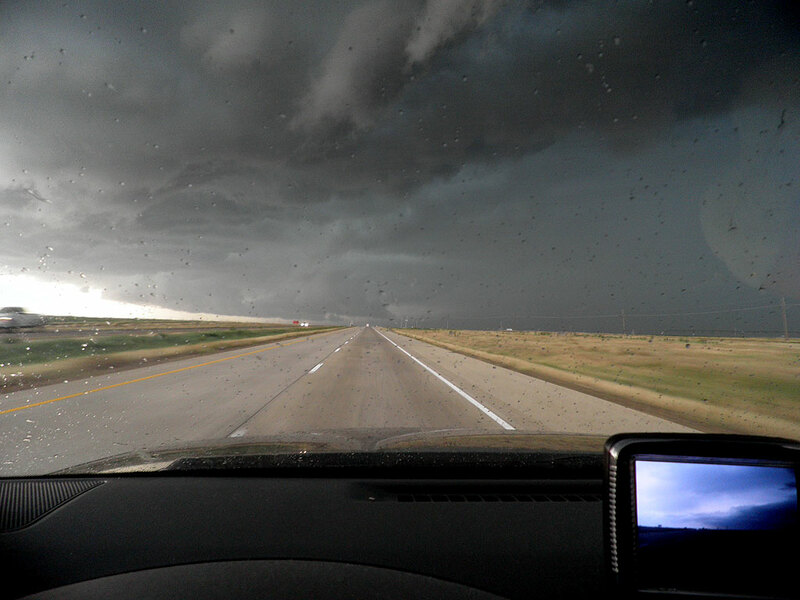 Abby makes pictures from her passenger-side window of an impressive, and later severe, thunderstorm in the east Texas panhandle. Abby made this image of me as we got out to photograph a thunderstorm with which we later tangled. 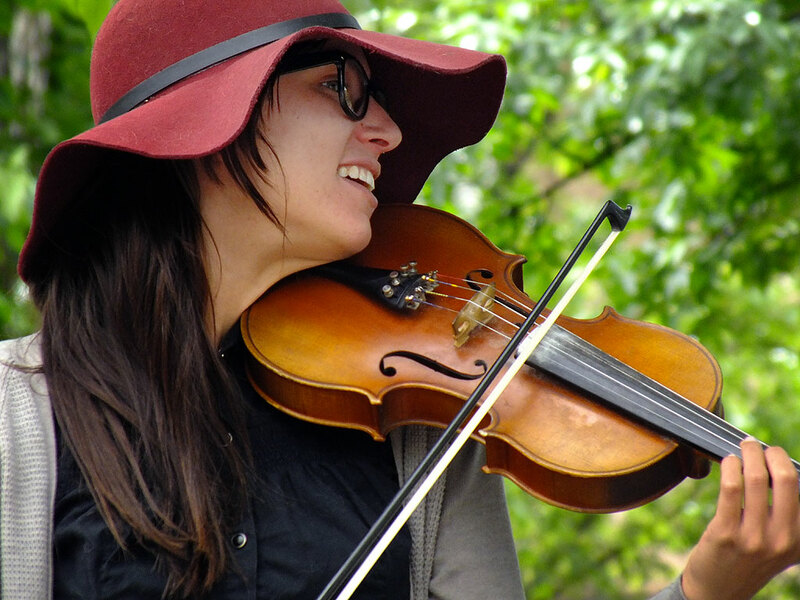 On the tenth anniversary trip, Abby bought a black leather cowboy hat at Russels Travel Plaza near the New Mexico/Texas border, and ended up loving, and wanted to get one just like it in brown. We found one hat, a U.S. flag design, in Shamrock, Texas, and the one she originally wanted, olive colored, at Russell’s. As we approached this thunderstorm and heard dire warnings about it on the weather radio, we decided to take the next exit and head south, but that plan was cut short. Though we were the first to take cover beneath this underpass, we were joined by a number of vehicles of all sizes, avoiding hail, gail force winds and zero visibility. 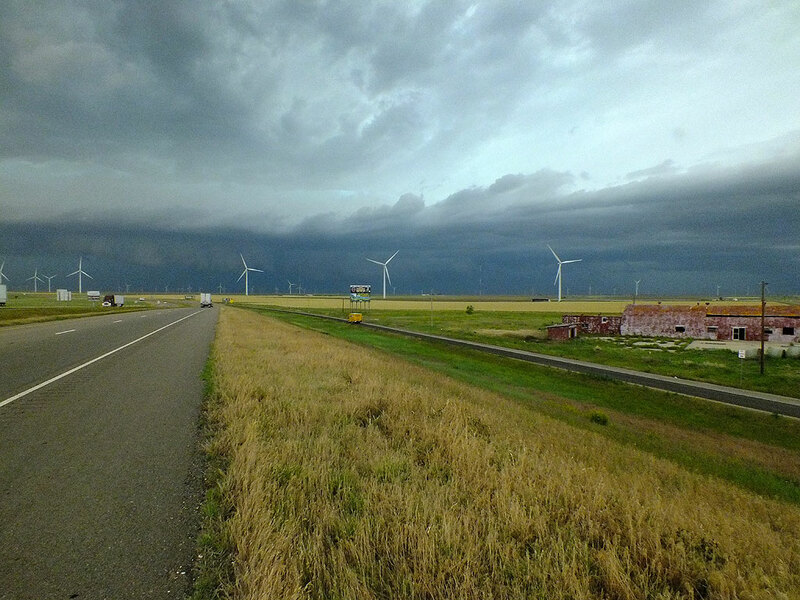 By the Oklahoma/Texas line we encountered thunderstorms. We listened to the weather radio on my Icom IC-V8000 2-meter and heard a forecast for hail in our path. While trying to turn south the storm caught up with us, and we decided to stop at the underpass, just in time for hail, high winds, torrential rain. 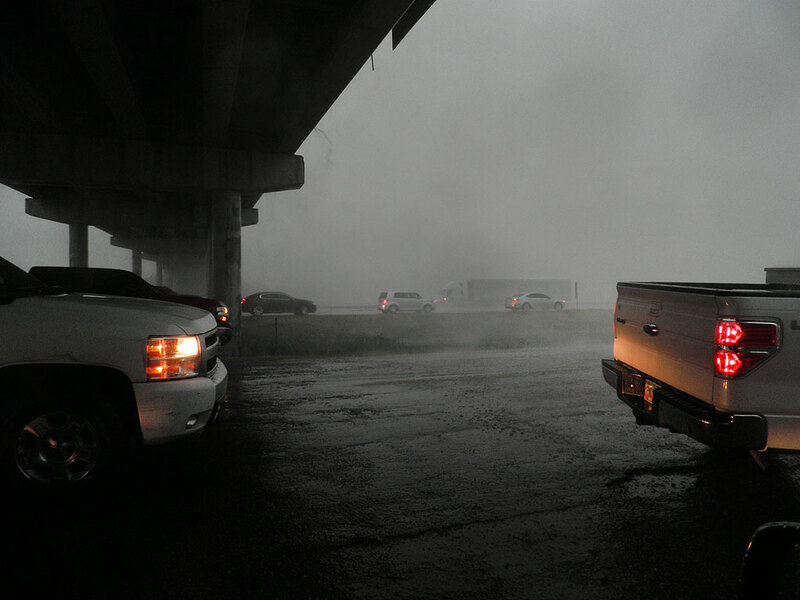 We were the first to stop there, but many cars and trucks joined us to wait it out. 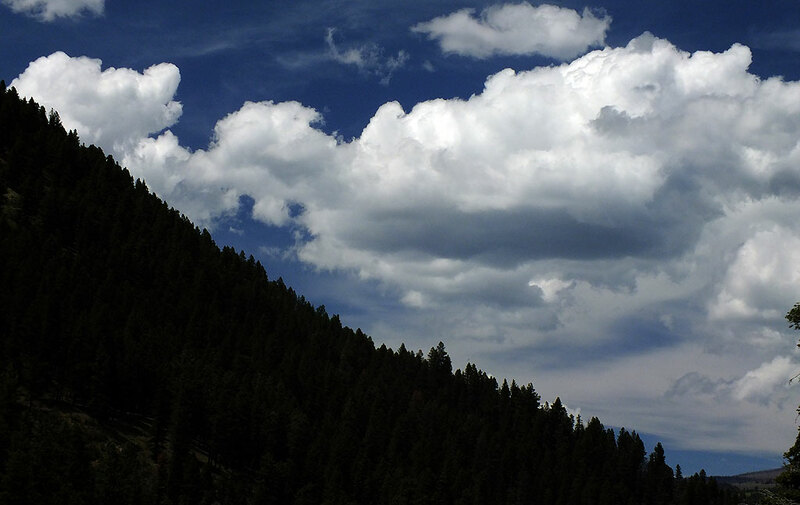 Once into New Mexico, we had clearing skies. With the storm behind us and the sun emerging, I asked Abby to watch in the mirrors for a rainbow, and within a minute or two we spotted one forming. It ended up being a bright, full double rainbow. I got out to photograph it despite light rain continuing to fall, and was happy that I did. We approached a severe thunderstorm in the Texas Panhandle, and later took shelter from it. 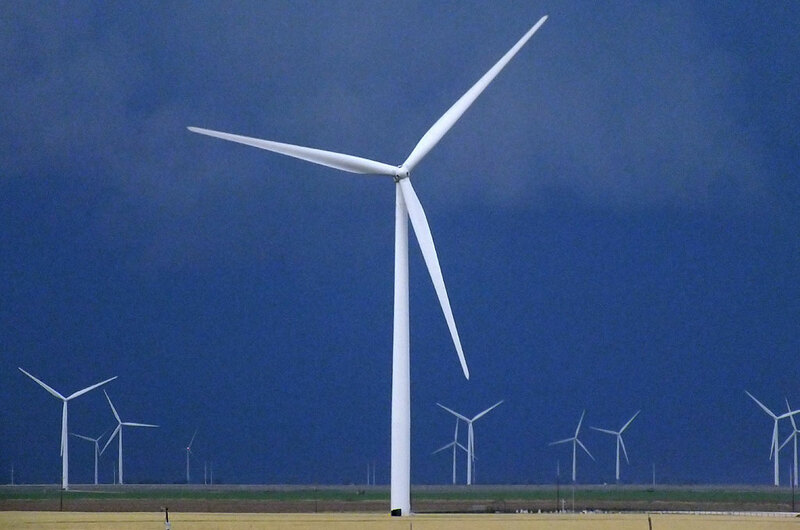 Wind turbines take on an eery appearance against the blue-grey of an approaching severe thunderstorm. 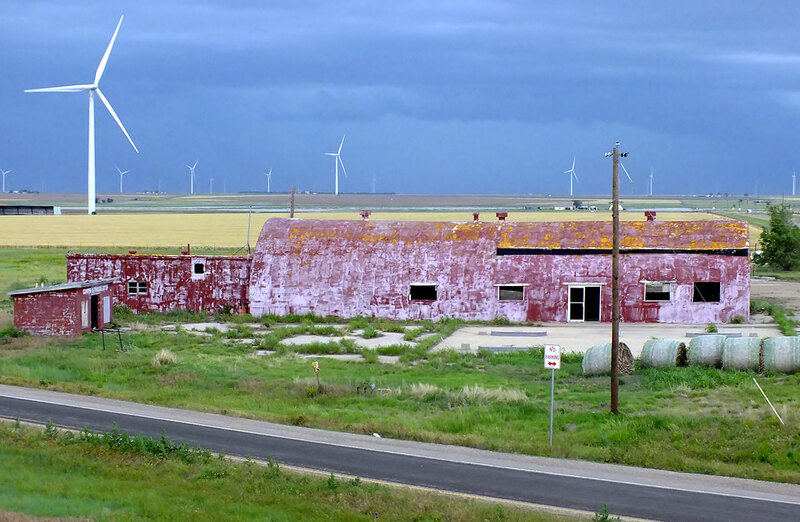 Abby made this image of the approaching thunderstorm in Groom, Texas, featuring the fading red quonset hut I have been photographing for over a decade. 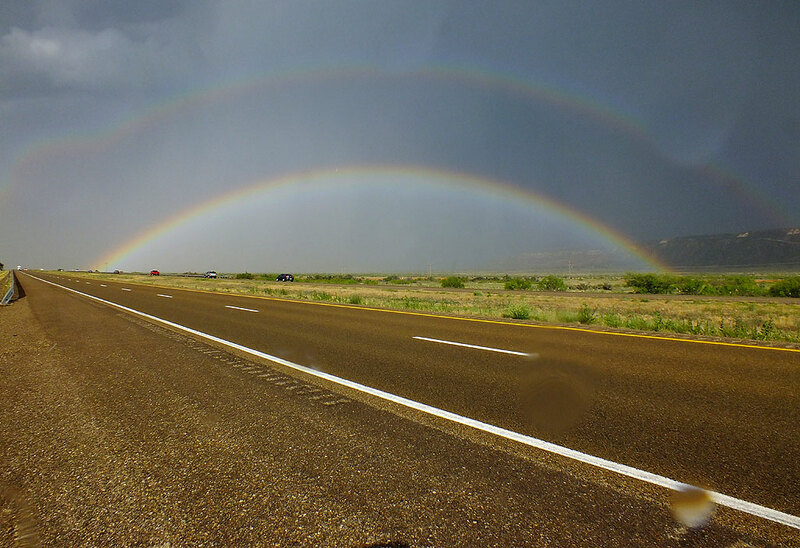 You can see raindrops on my lens in this image showing a full, bright double rainbow looking east along interstate 40 in eastern New Mexico. Abby and I spotted this sign at Russell’s Travel Stop in eastern New Mexico. I shot a nice sunset about 15 miles south of I-25. 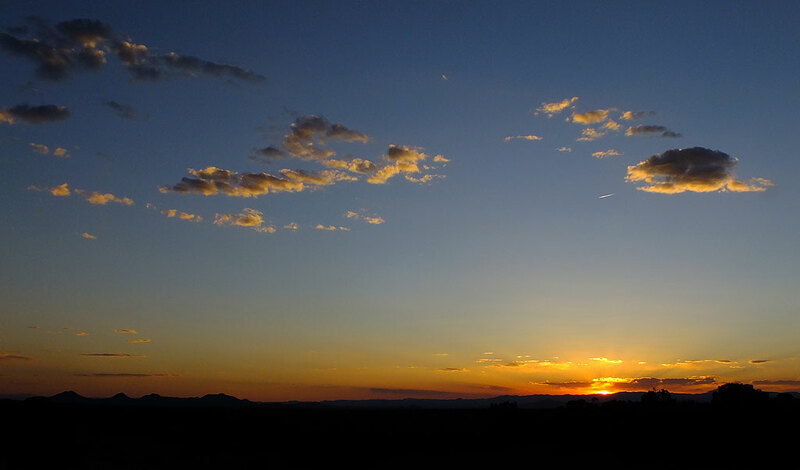 After stopping at Clines Corners, then turning north to Santa Fe, we stopped to shoot this nice New Mexico sunset. 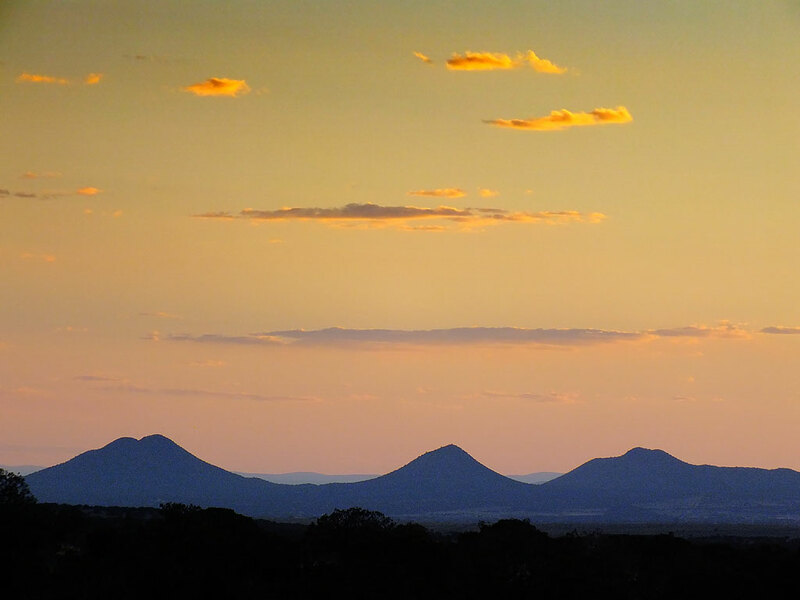 This is another view of the sunset we made on our first day on the road. 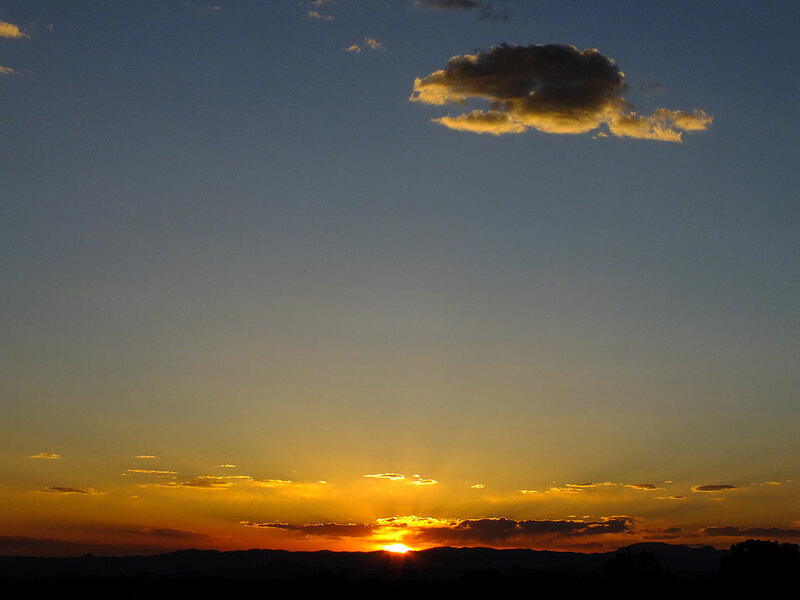 This is one of the images I made during a nice sunset about 20 miles south of Santa Fe. 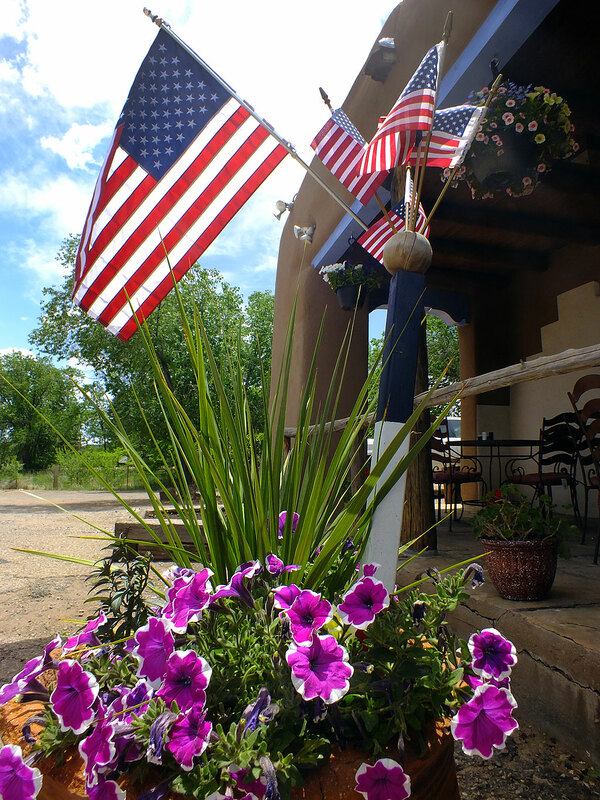 I spotted these U.S. flags on display at The Casanova Restaurant in Pecos, New Mexico. Abby didn’t sleep well so she sent me on my way. 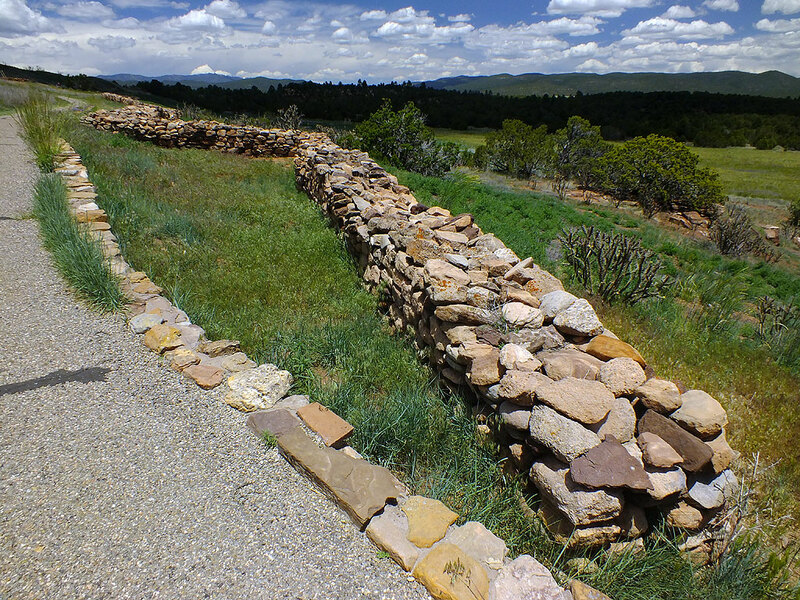 I drove down to Pecos National Historical Park. When I tried to photograph it in 1999, the light was such a bust that I didn’t shoot anything. This time, though, the sky was alive, and I was very pleased with the result. I hiked the easy 1.5 mile ruins trail. I spotted these flowers as I approached the mission preserved at Peco National Historical Park. 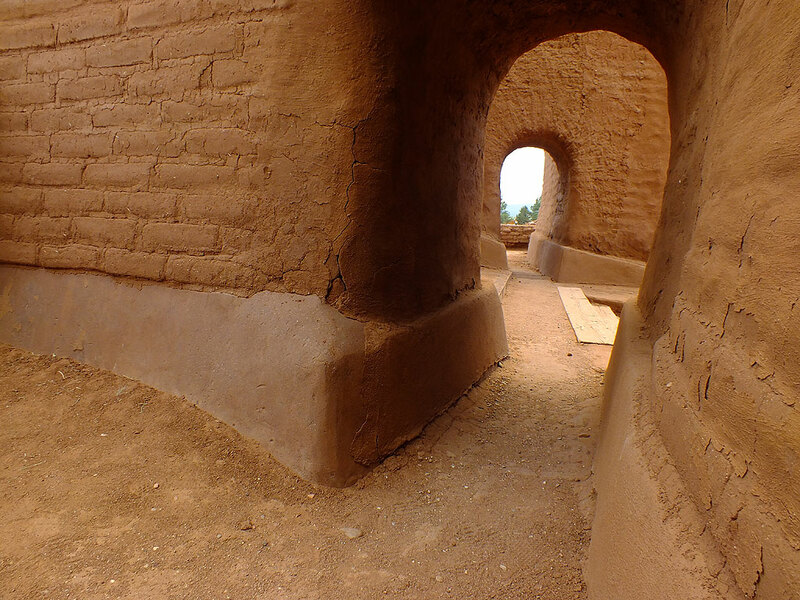 Probably the strongest image I made at Pecos National Historical Park, I shot this inside the adobe mission there. 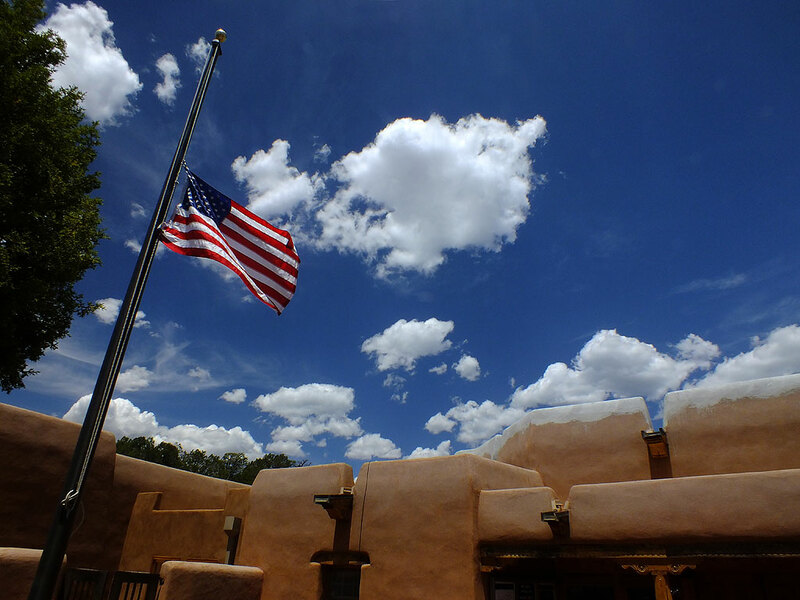 The sky was being particularly beautiful at the Pecos National Historical Park’s visitor center. 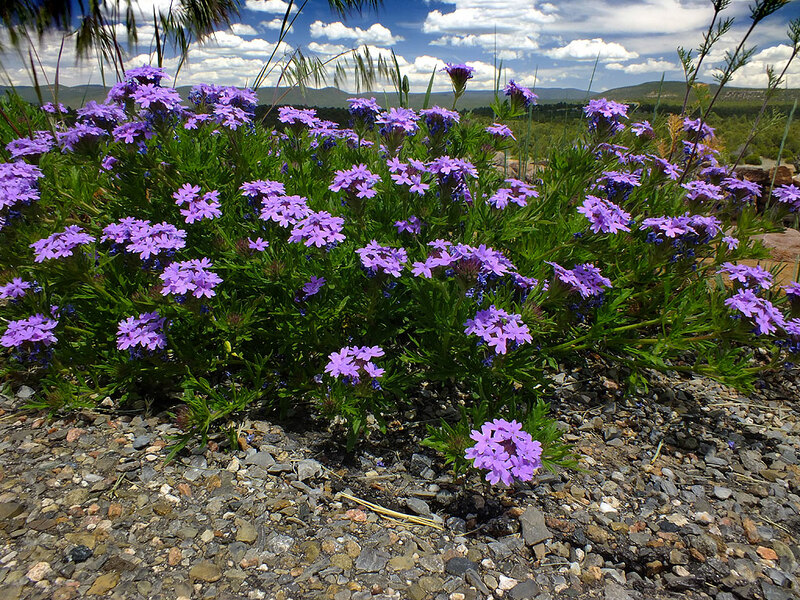 Wildflowers populated most of our destinations on this trip, including these on the trail at Pecos NHP. 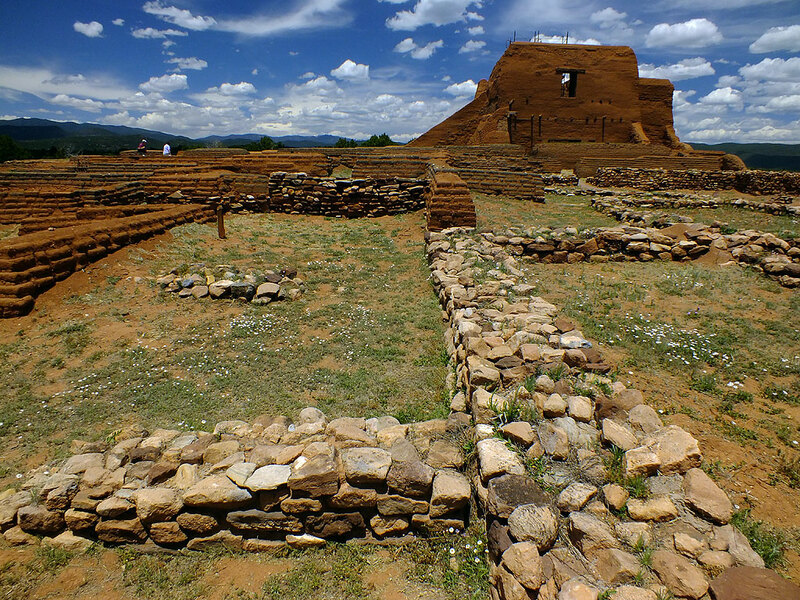 The trail at Pecos is paved, easy to walk, and follows a series of ruins like these. 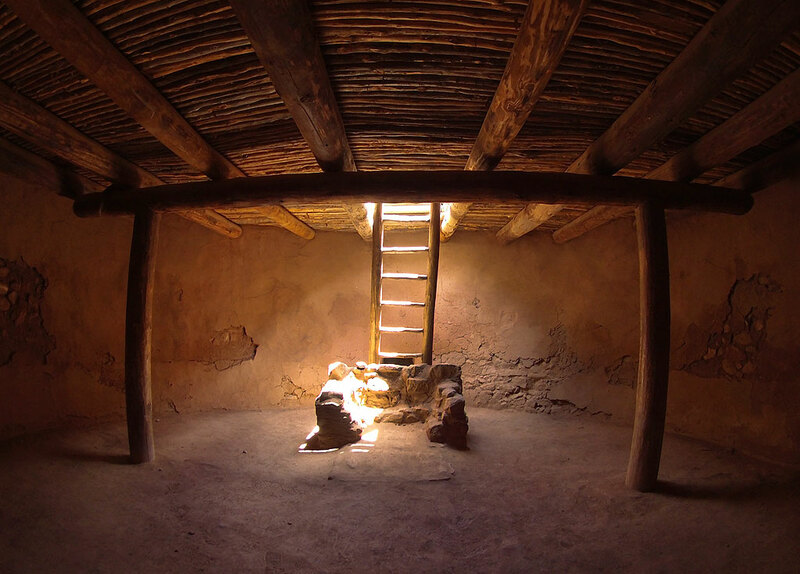 I made this image, inside a kiva at Pecos, with my Ion action cam’s still frame function. 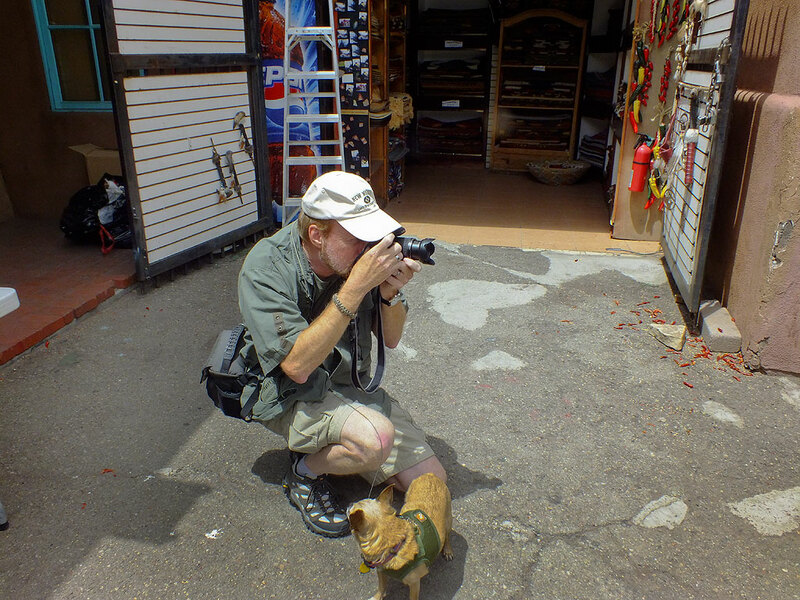 Although working without viewfinder is a little awkward, it still delivers a sharp fisheye view. 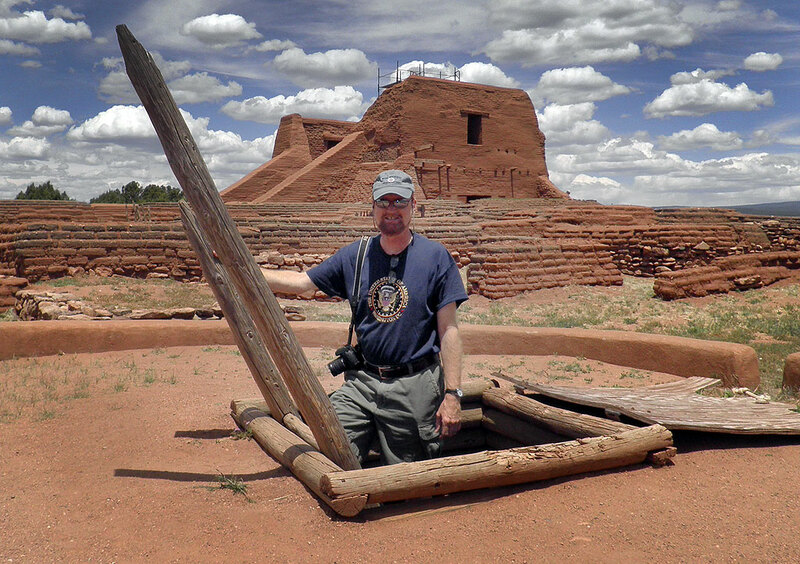 I asked another visitor to photograph me climbing out of this kiva at Pecos NHP. 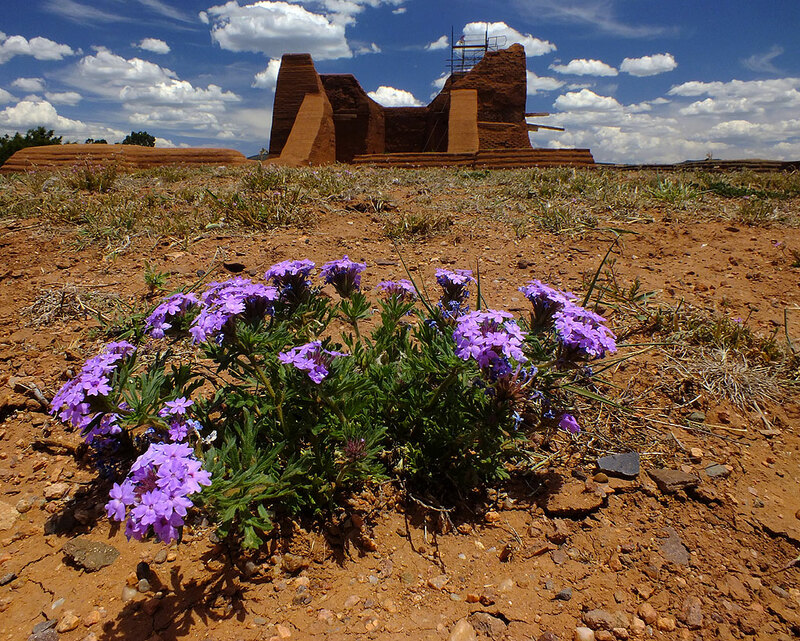 The mission is the largest artifact preserved at Pecos NHP. 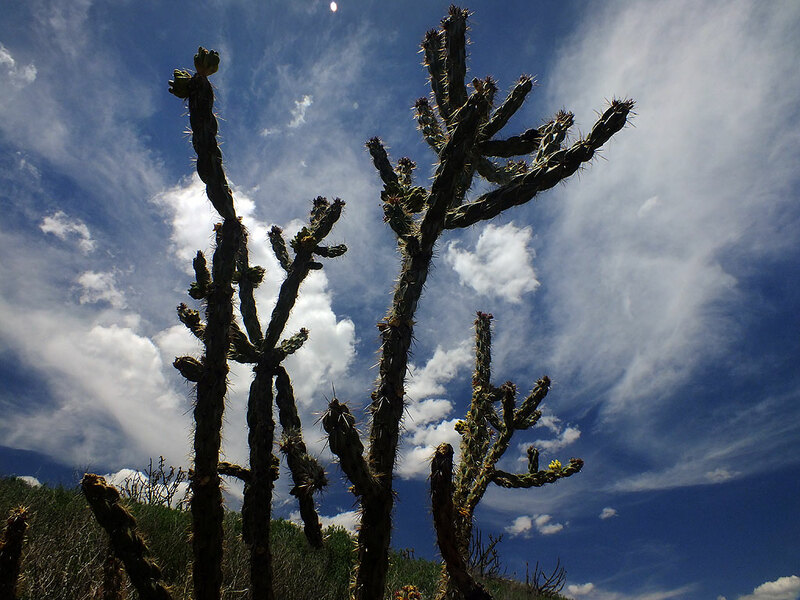 A chollo is silhouetted against the New Mexico Sky at Pecos NHP. 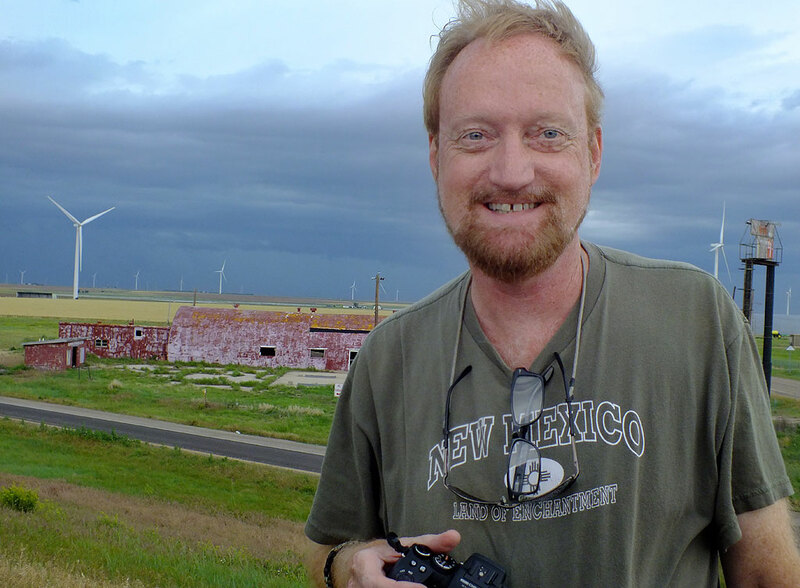 I then drove New Mexico 63 north as it follows the Pecos River, as I did in 1999, but shot much more than on that occasion, with great light and a sense of inspiration. 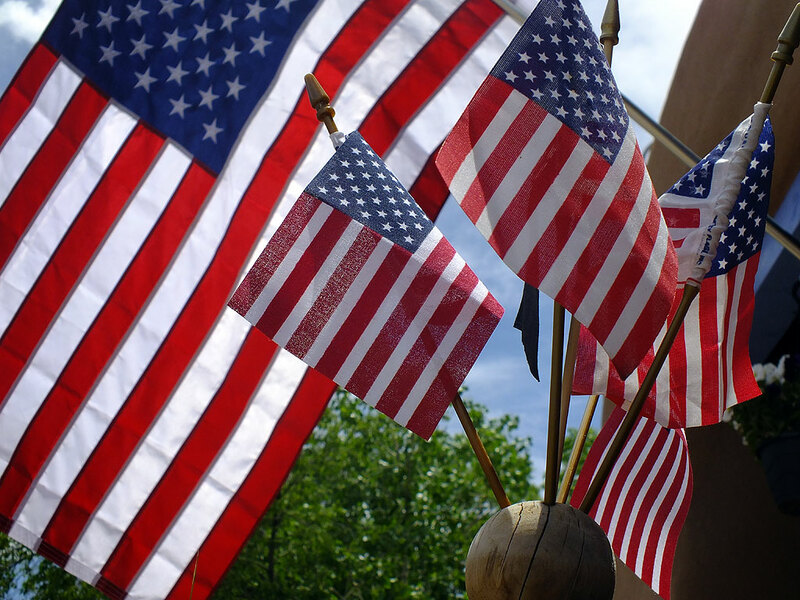 I photographed these flags at The Casanova Restaurant in Pecos, New Mexico. 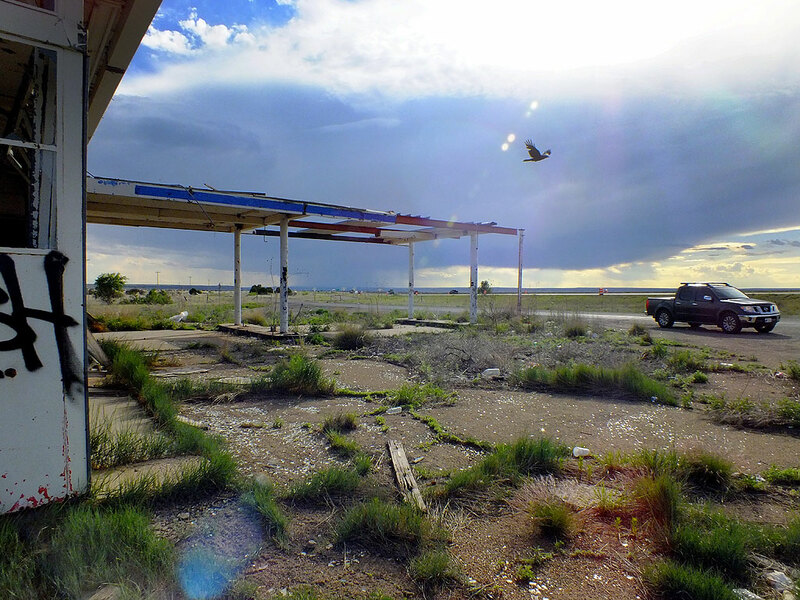 North of Pecos, I spotted this abandoned restaurant. 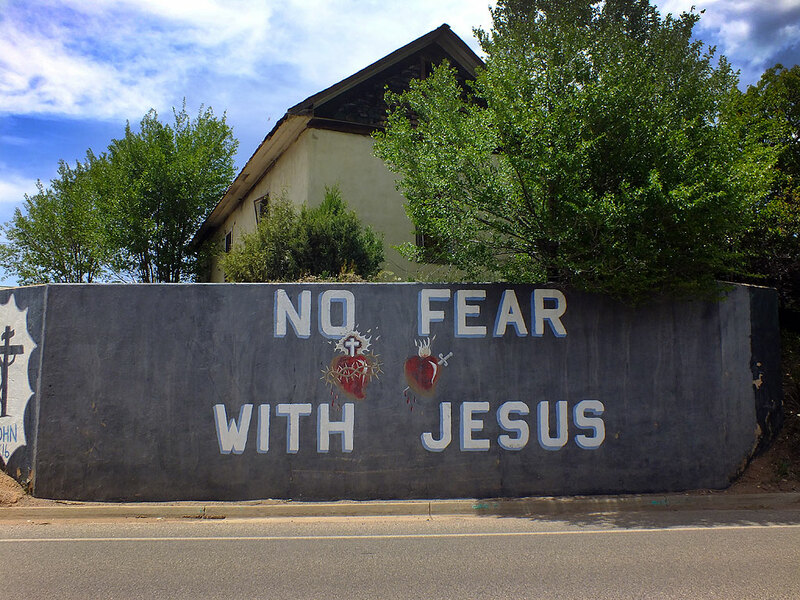 Also in Pecos, I saw this wall. 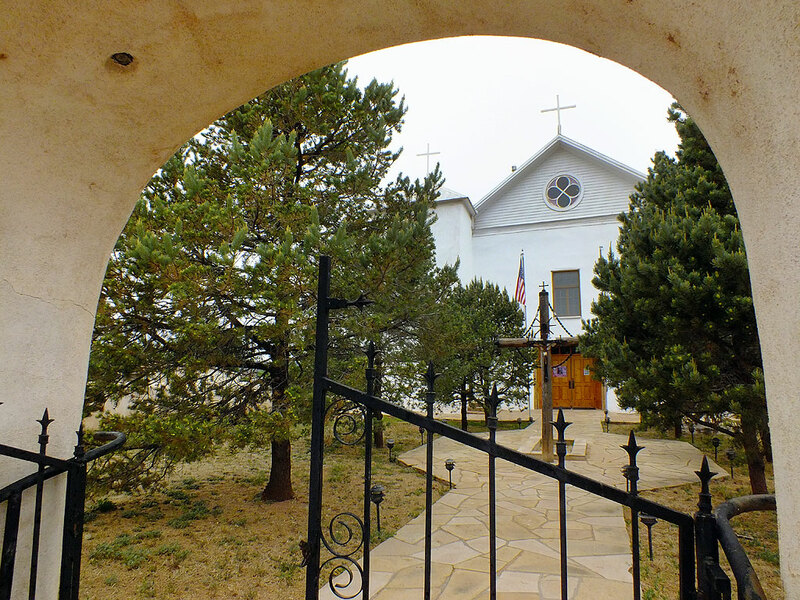 I stopped to photograph the handsome chapel I shot in 1999. On that occasions, it was bathed in brilliant morning light, but this time it was midday and the light was slightly more subtle. 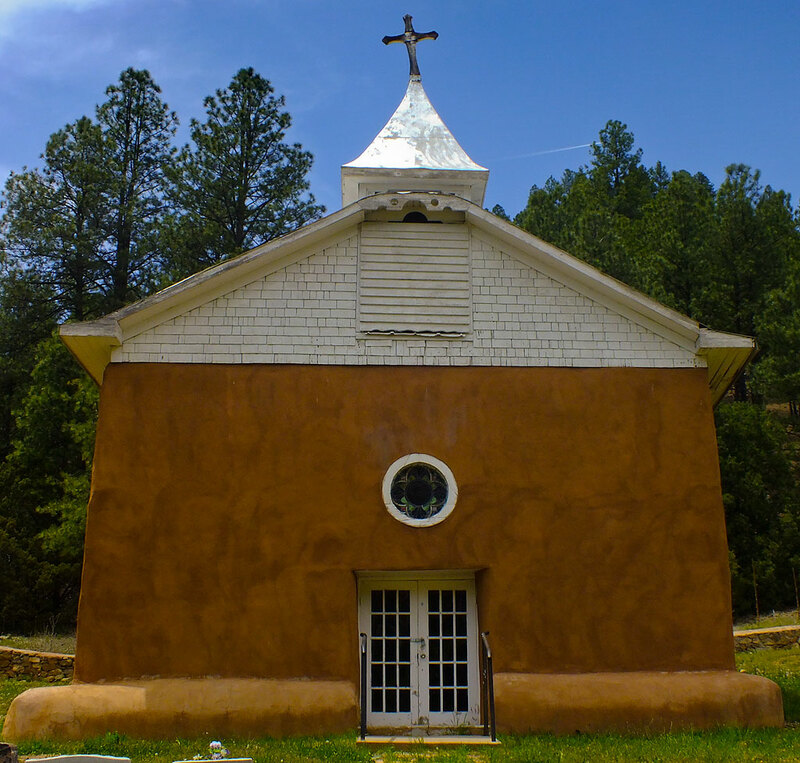 Readers might recall that I photographed this elegant chapel in the Sangre de Christos Mountains in 1999. 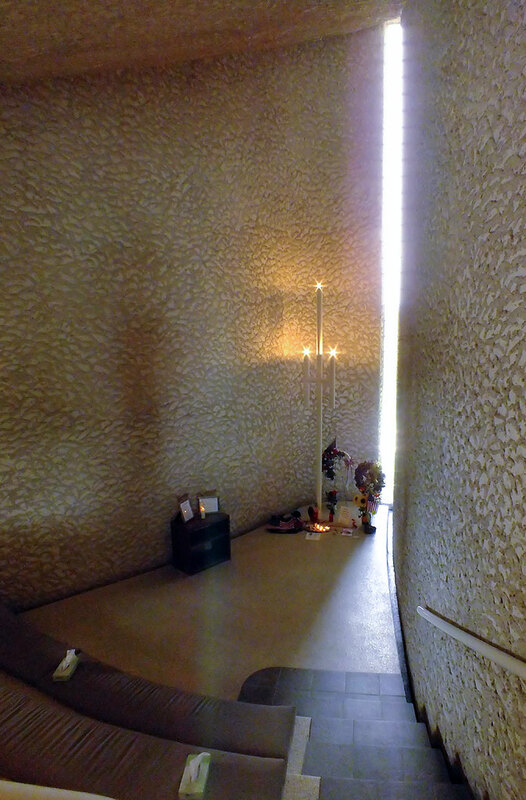 Surrounded by a low wall and a small cemetery, this chapel on New Mexico 63 is quite eye catching. I photographed it once before, in 1999. 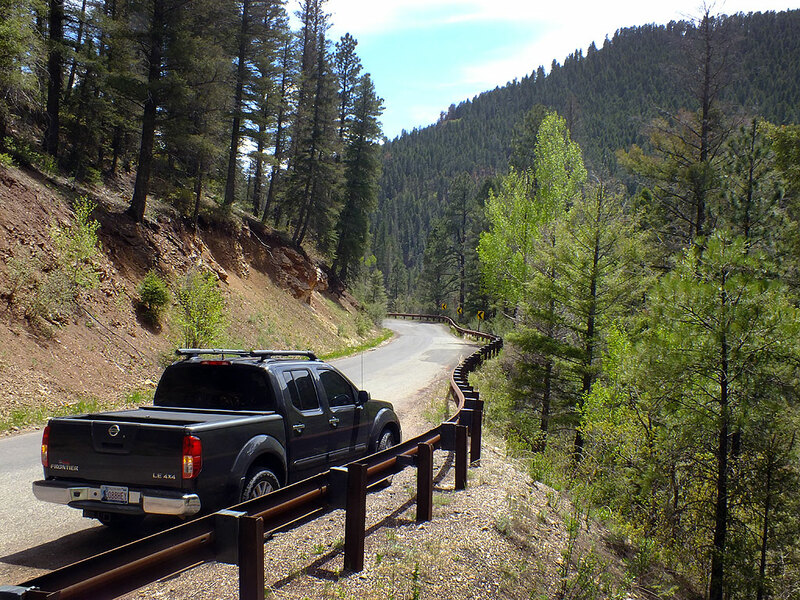 Near the north end of New Mexico 63, the road climbs into a gorgeous canyon surrounded on all sides by mountains. 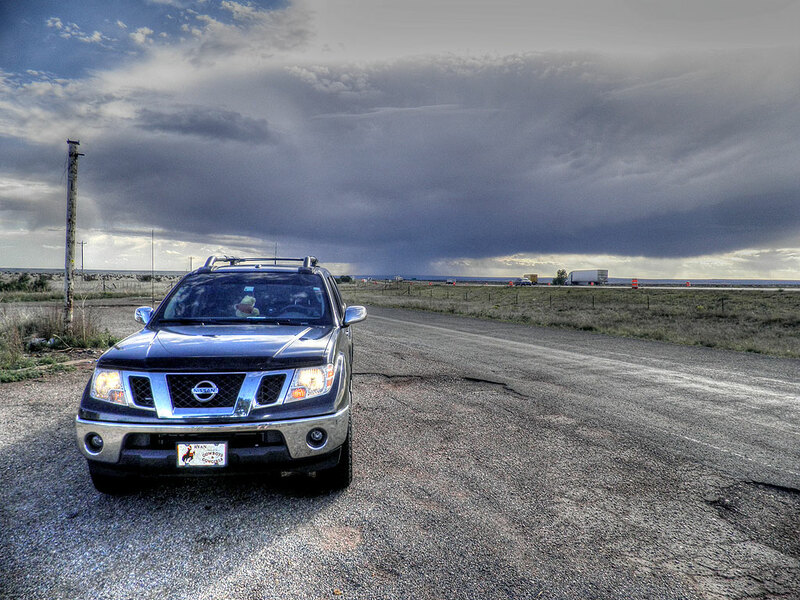 Our Nissan Frontier sits on the roadside near the town of Cowles. 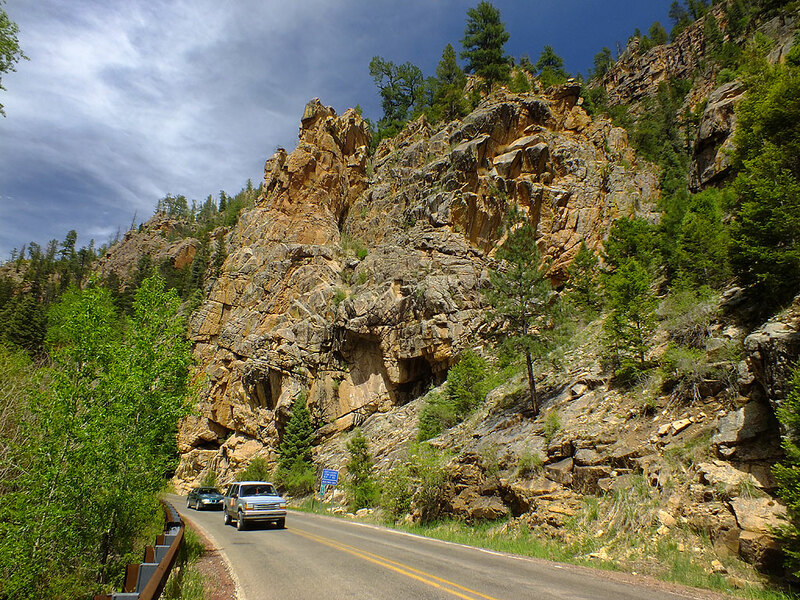 Highway 63 passes several handsome palisades, like this one, with traffic passing to show scale. 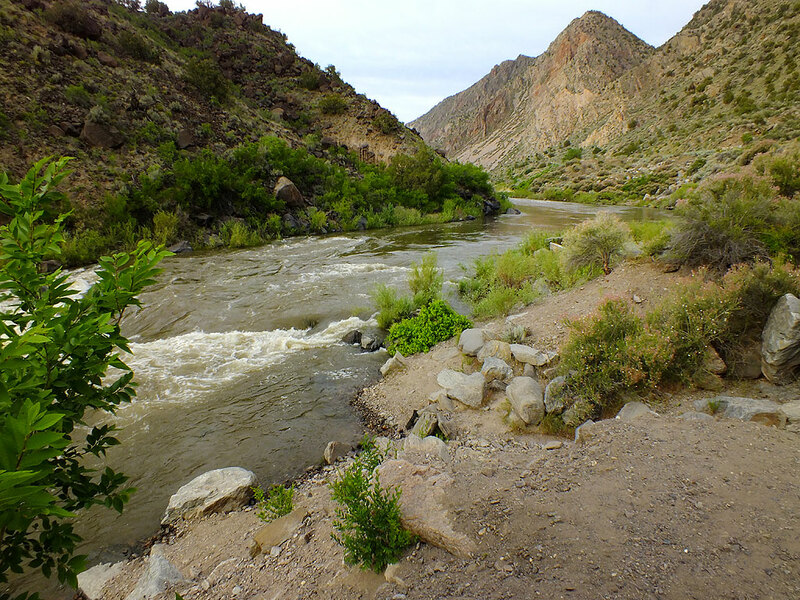 Full of water from spring snowmelt, the Pecos River rages downcanyon. 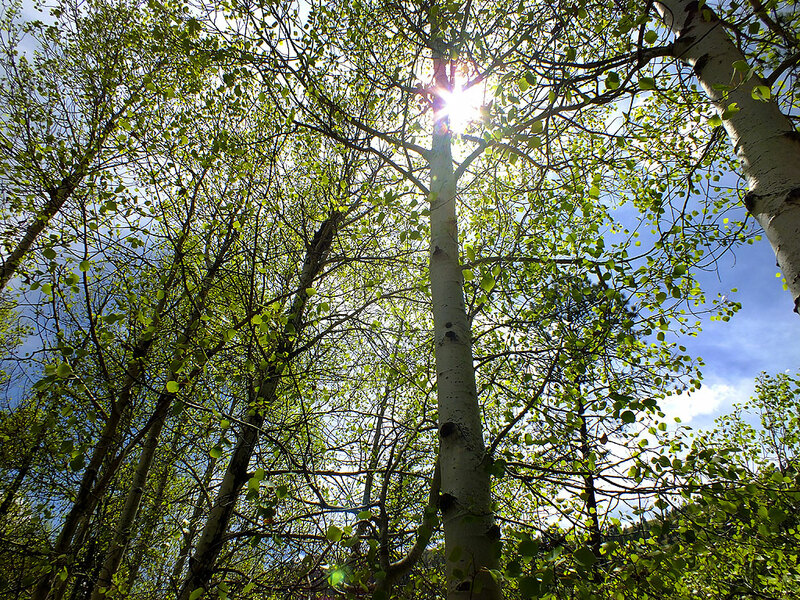 I shot these aspens along New Mexico 63 in the Sangre de Christos Mountains. 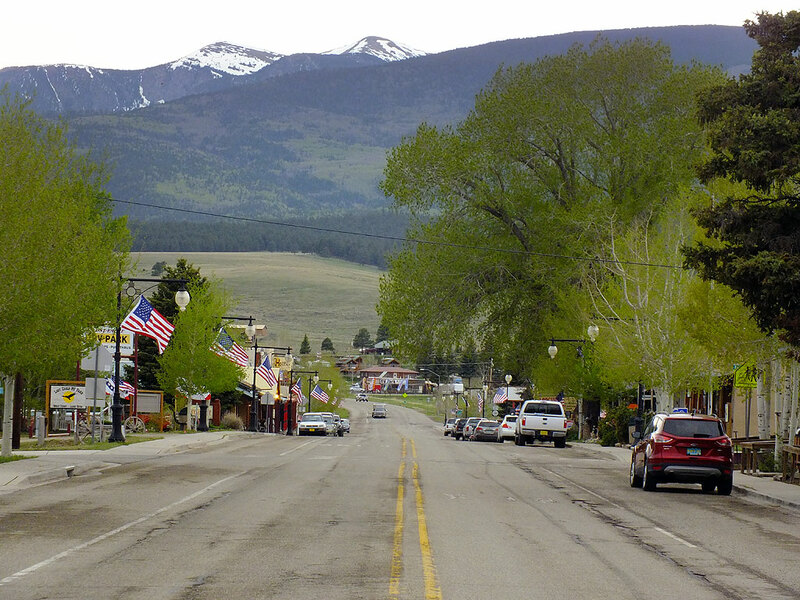 I wanted to show Abby the storied Enchanted Circle, the area in the vicinity of New Mexico’s high point, Wheeler Peak. We stopped at Taos Visitor Center, where I bought a cool waterproof regional hiking map and Abby got a few souvenirs. 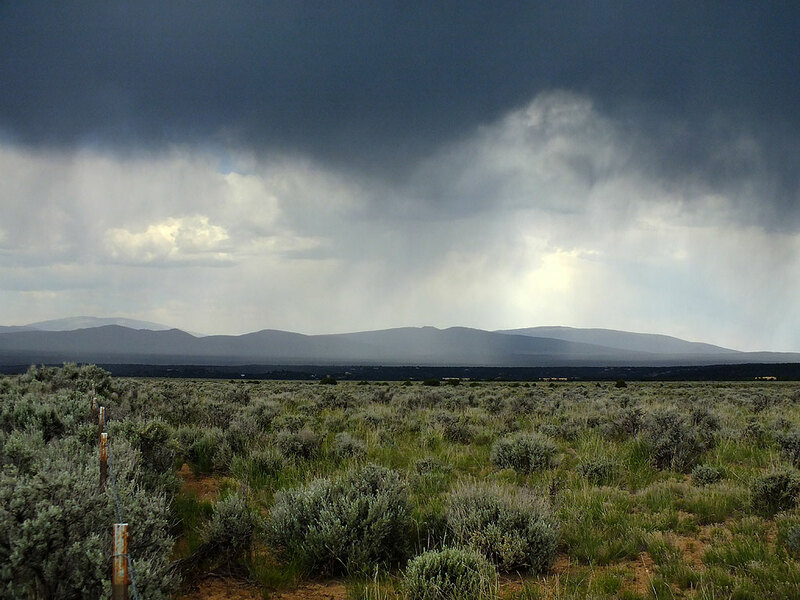 Thunderstorms rolled through the area, creating a moody look to our images, like this one I made south of Questa, New Mexico. Abby and I stopped at Red River to look at souvenirs. The floors in this shop were old wooden planks. Because of stormy weather and the direction it seemed to be moving, we decided to take the “circle” clockwise. The road to our first stop, Questa, was the eery open rangeland common to New Mexico that I have loved and photographed for years. The weather was gloomy, and we took advantage of it to make some very moody images. Turning East from Questa the landscape becomes far more mountainous. 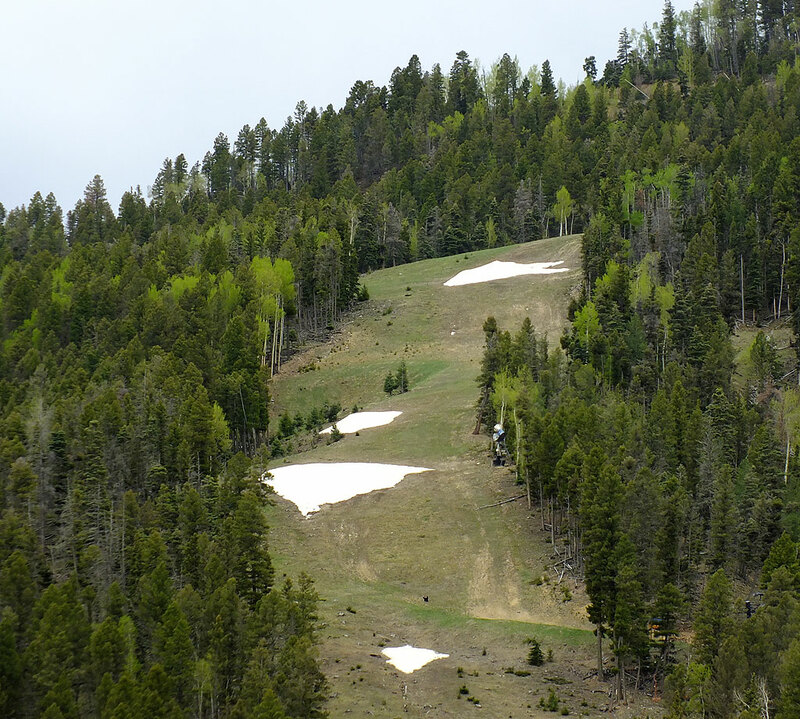 The Red River ski area has only a few patches of snow left. At Red River, Abby wanted to stop and shop for souvenirs again, one of her favorite pastimes. 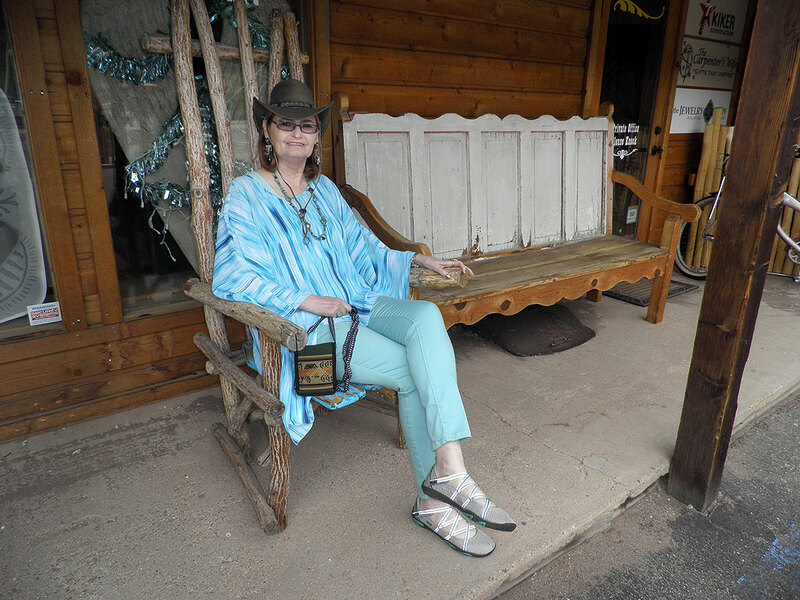 Abby poses on a bench at a shop in Red River, New Mexico. 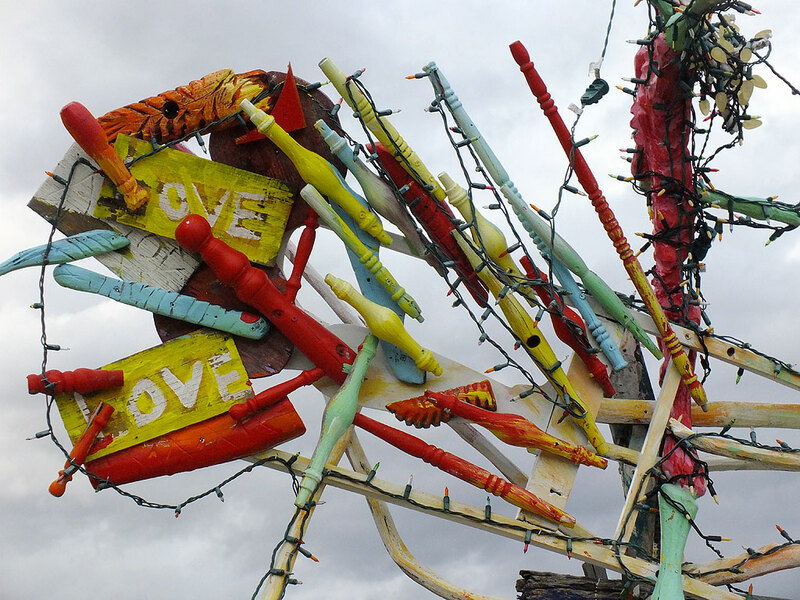 We spotted this oddity – possibly the Enchanted Monster, near Elizabethtown. 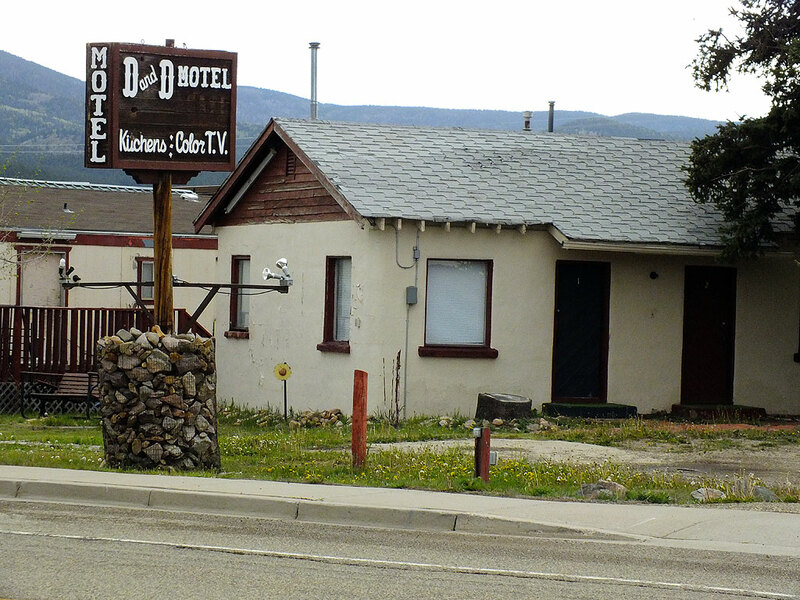 For many years my friends and I stayed at the D&D Café and Motel in Eagle Nest, New Mexico when we went on ski trips to nearby Angel Fire. It was cheap and clean, and they served a hearty breakfast. This view looks west down the highway as it passes through Eagle Nest, New Mexico. 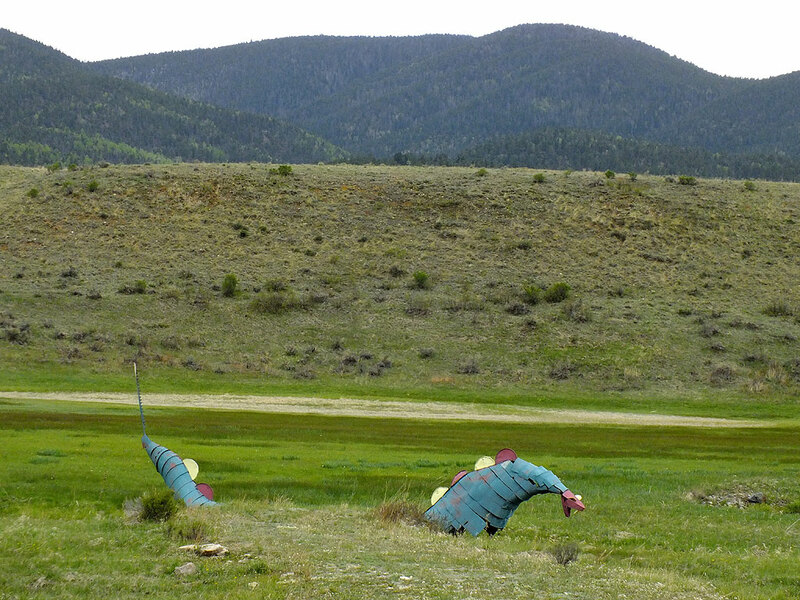 Near the top of the frame is Wheeler Peak, the high point of New Mexico. 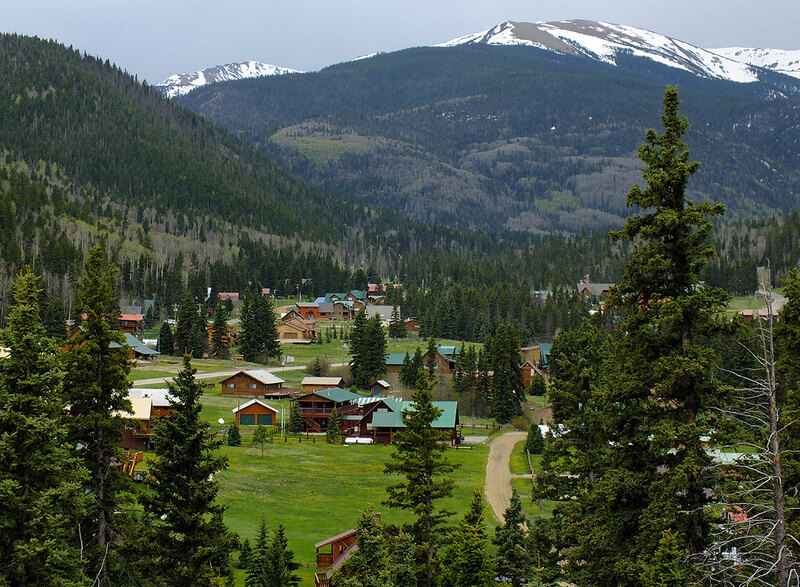 After our stop in Eagle Nest, we drove up the snakey road into Idlewild, the mountainside village where I had so much fun at a friends’ cabin when I was a teenager. 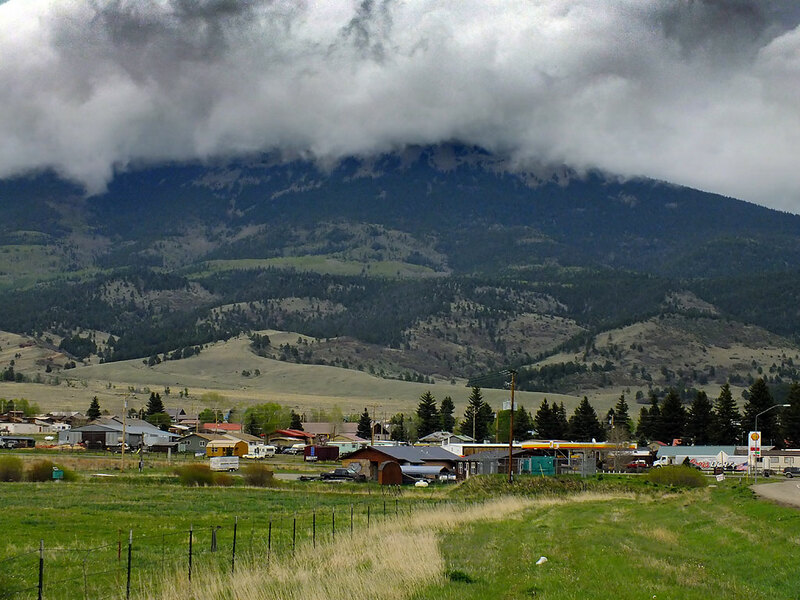 Looking back at Eagle Next, we captured this moody view of the Sangre de Christos Mountains partially shrouded in cloud. 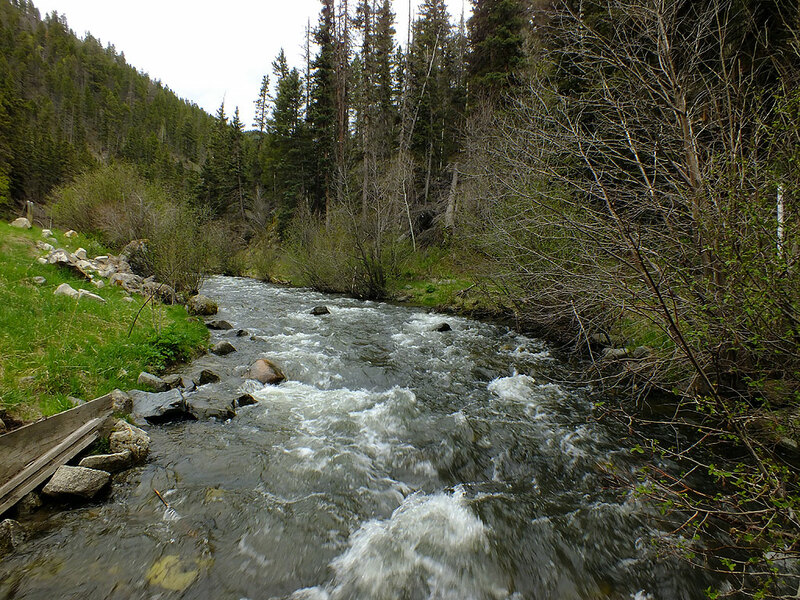 The Red River rushes past as we moved upcanyon; I felt it and it was quite cold. 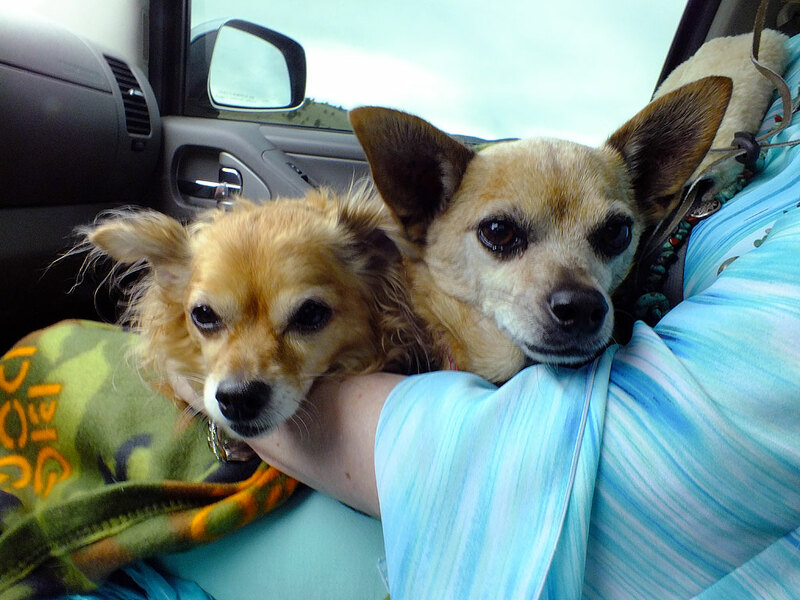 Our Chihuahuas, Sierra and Max, cozy up in Abby’s lap as we make our way up NM578. From Red River we took NM578 to the center of the Circle, looking for photo ops and taking in the scenery. We next stopped at Eagle Nest for a snack and to walk the dogs. 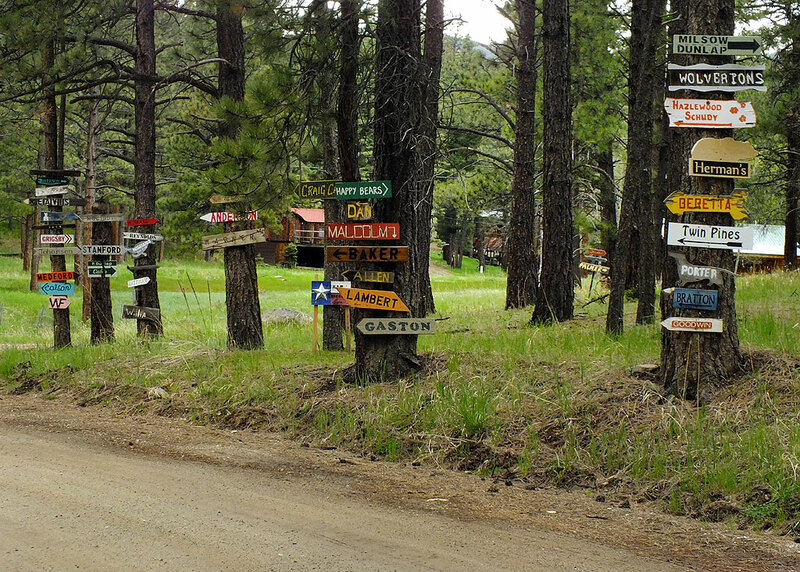 I photographed the main street, then took NM127 up the mountainside to Idlewild, a small village of cabins. I shared stories with Abby about the adventures we had there when I was a teenager. We drove up canyon on NM578 to the end of the paved road, spotting luxurious alpine retreats like these on the way. This is the view upon entering the Vietnam Veterans Memorial Chapel. In 1981, I learned to snow ski at nearby Angel Fire. 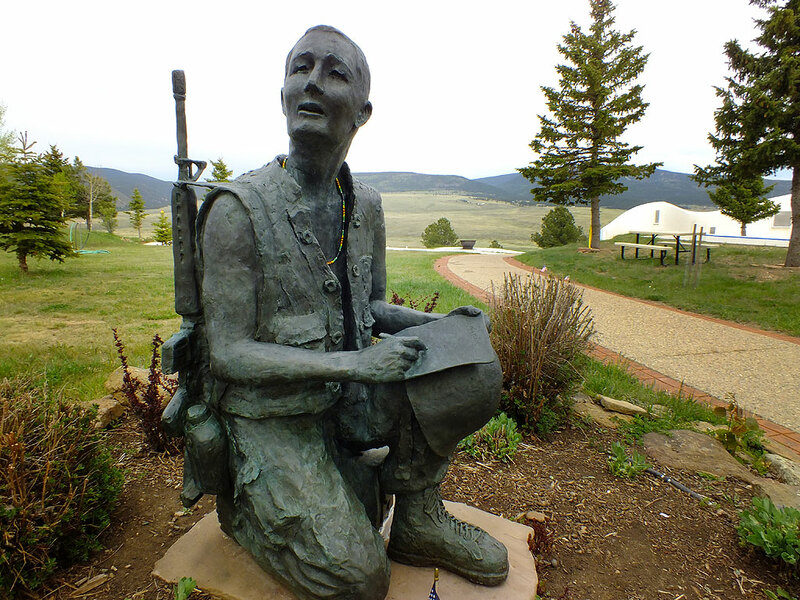 Next on our driving tour was the Vietnam Veterans Memorial State Park, which I’d passed on a number of occasions over the years, but never stopped. 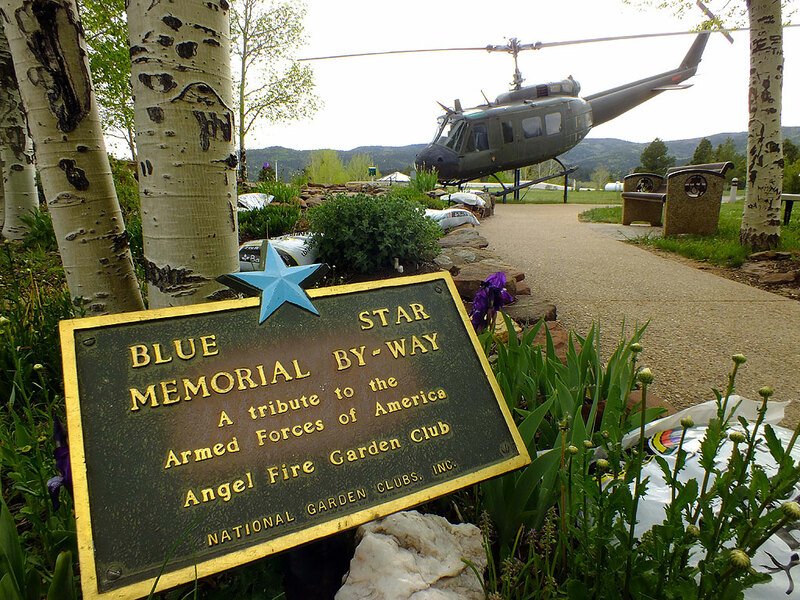 The site features a handsome garden with statues and a Bell UH-1 Iroquois “Huey” helicopter on display. The chapel itself was quite small, but very elegant. This view of the Vietnam Veterans Memorial State Park shows the Huey helicopter on display. 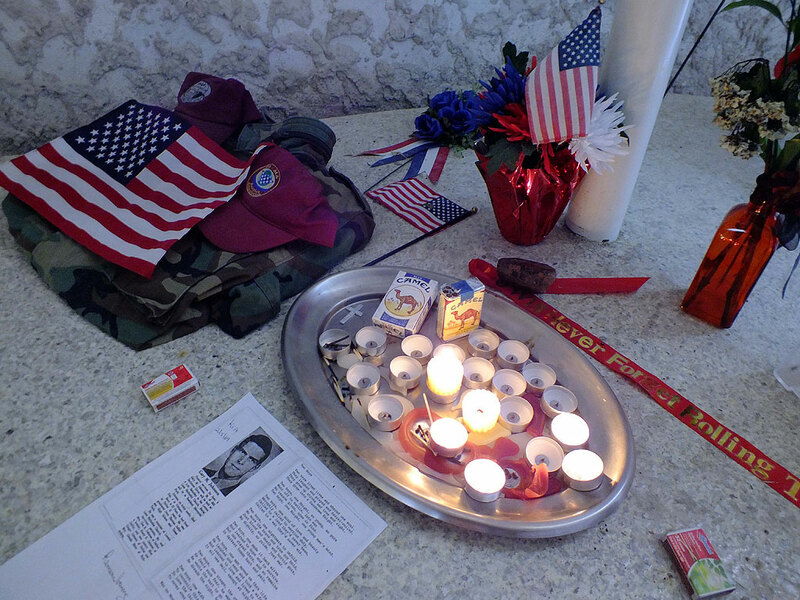 Lit candles and flags sit on the floor at the front of the Vietnam Veterans Memorial Chapel. A yellow ribbon decorates a tree at the Vietnam Veterans Memorial State Park. 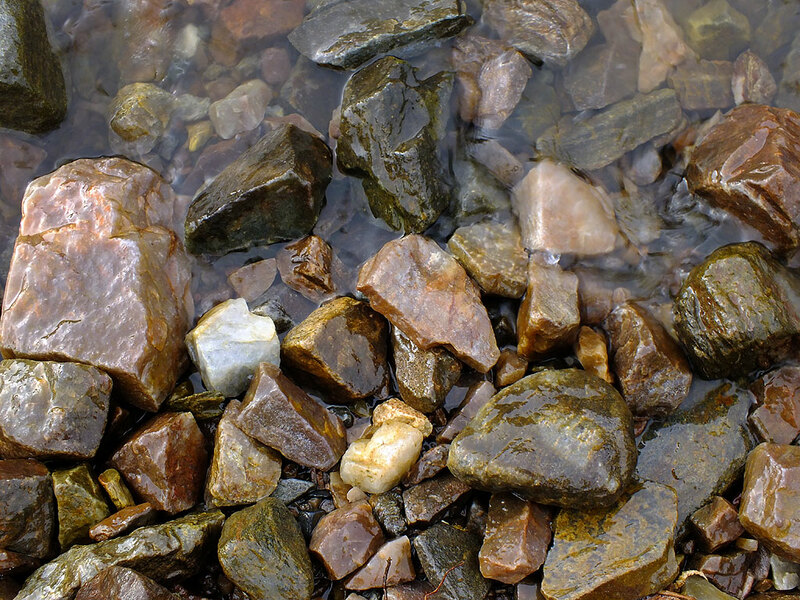 Waters of the Rio Grande lap against stones on the east bank. 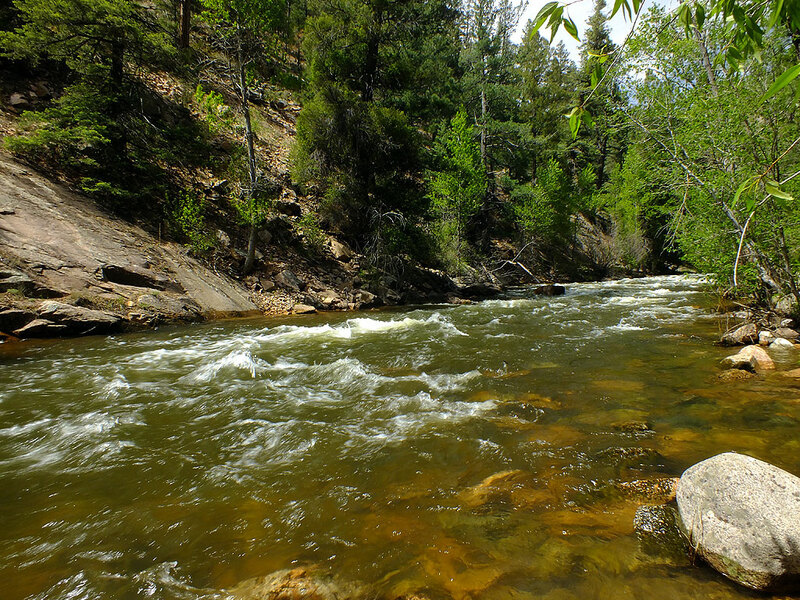 South of Taos on NM68, we stopped to photograph the Rio Grande. 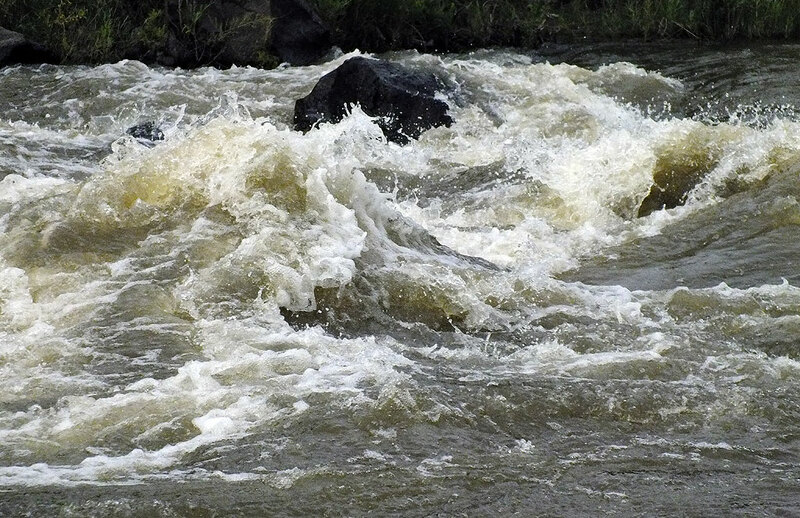 Burgeoning with snowmelt, the Rio Grande rages against boulders in its bed. 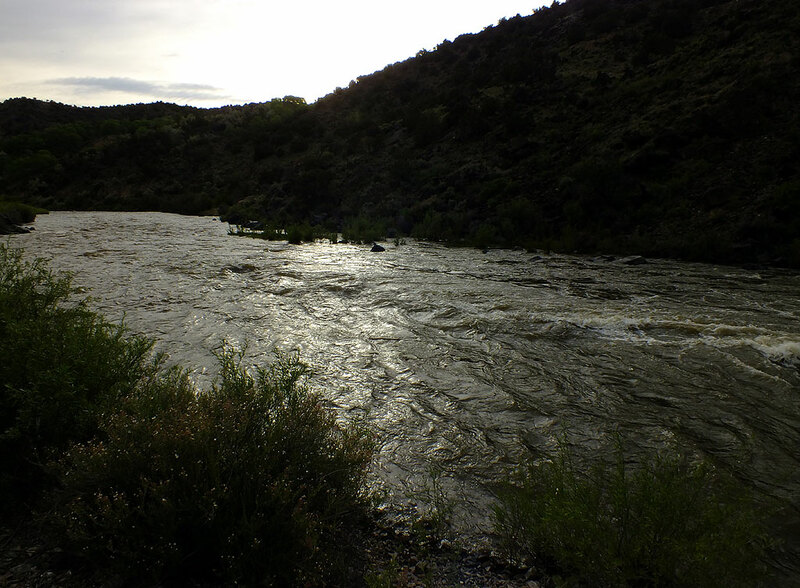 Looking downstream at the Rio Grande in afternoon light, this image is very reminiscent of the first chase scene in No Country for Old Men. 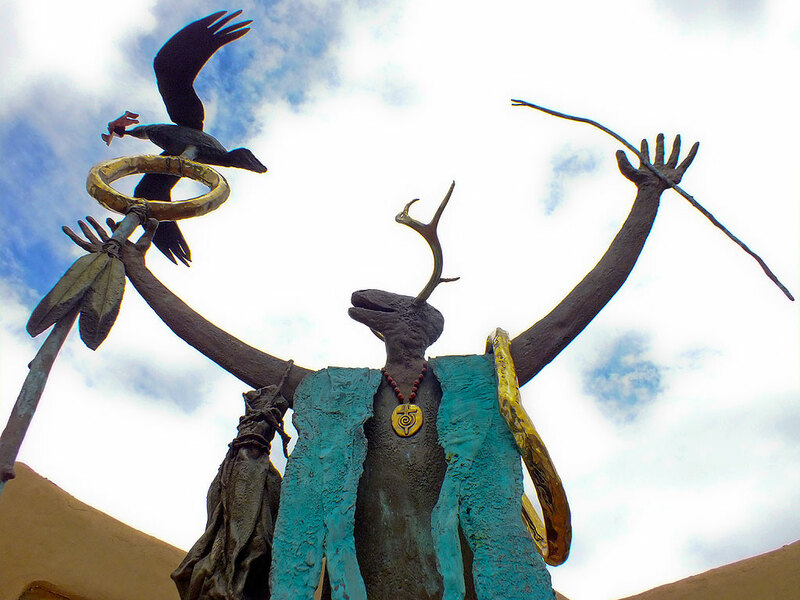 Our drive around the Circle continued through the mountains to Taos, then back to Santa Fe. 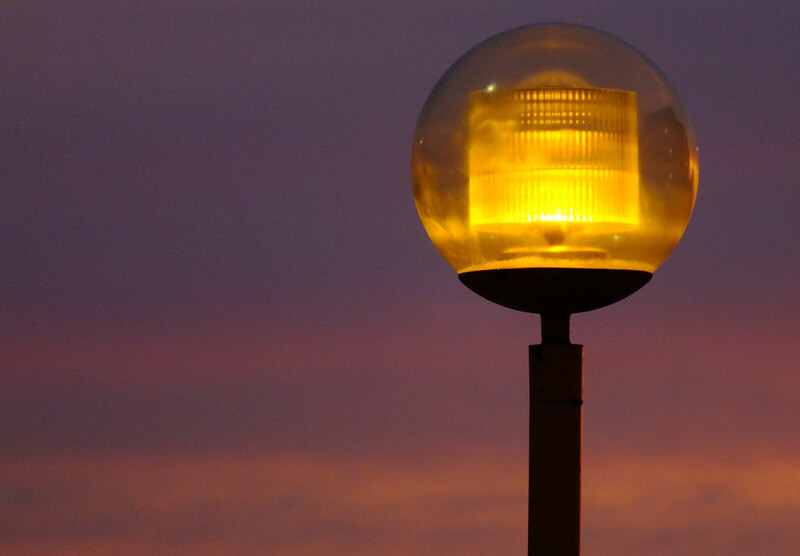 Back at our motel after dinner, I made this image of a patio light after sunset. 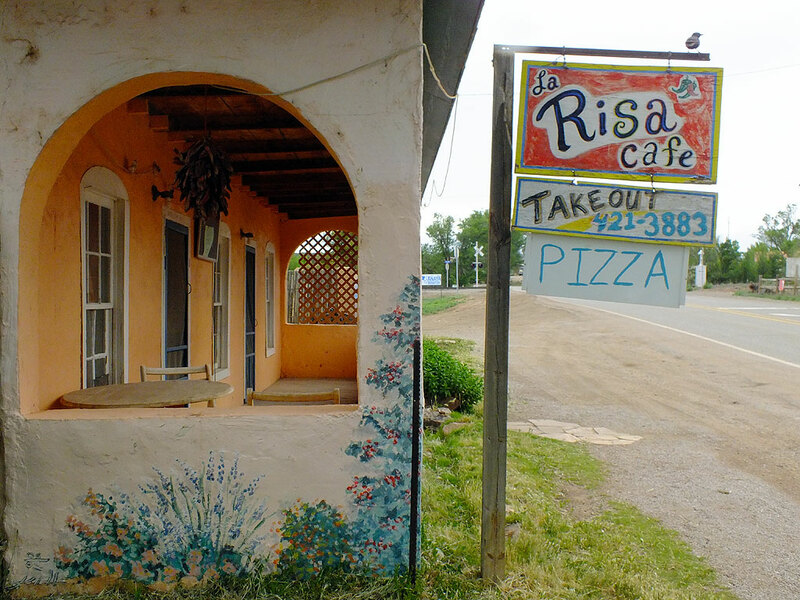 La Rise Café in Ribera, New Mexico was named The Sad Café in 1999. 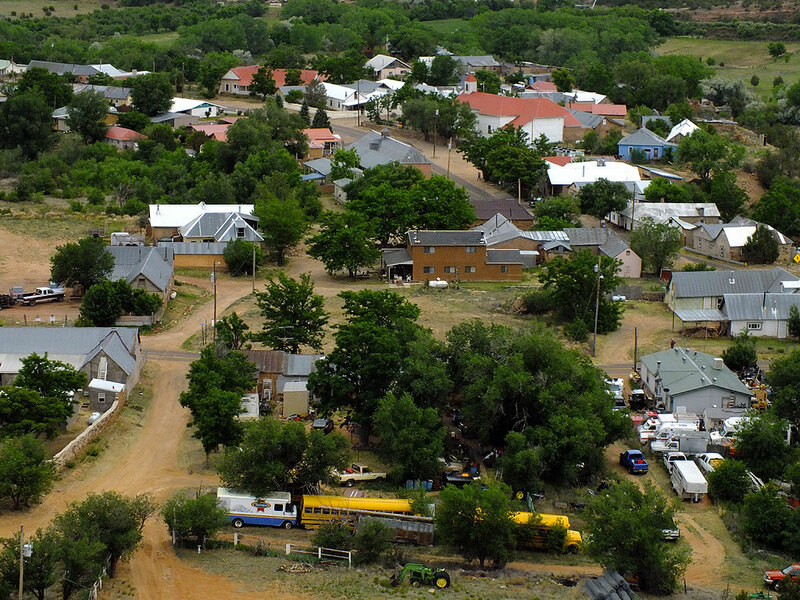 I got up very early and left Abby and the dogs to spend their morning at leisure, and drove I-25 to NM3, where I turned south and made the drive to Villanueva, the village where I borrowed a summer house on the trip in 1999. Despite a chilly rain, I photographed a number of sites, including La Rise Café, which in 1999 was known as The Sad Café. “La Risa” means “laughter” in Spanish. 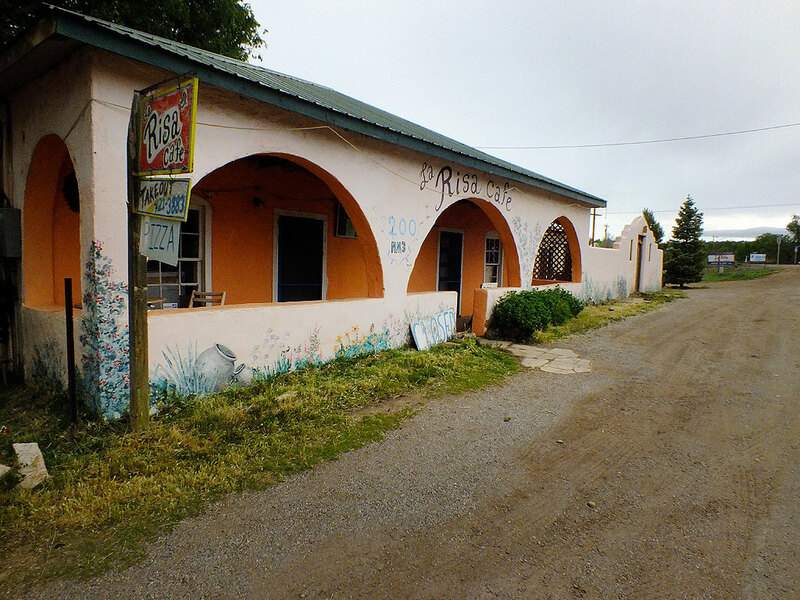 The La Risa (laughter) Café was my first stop on an early morning, rainy drive down NM3 to Villanueva, New Mexico. In 1999, this place was called The Sad Café. 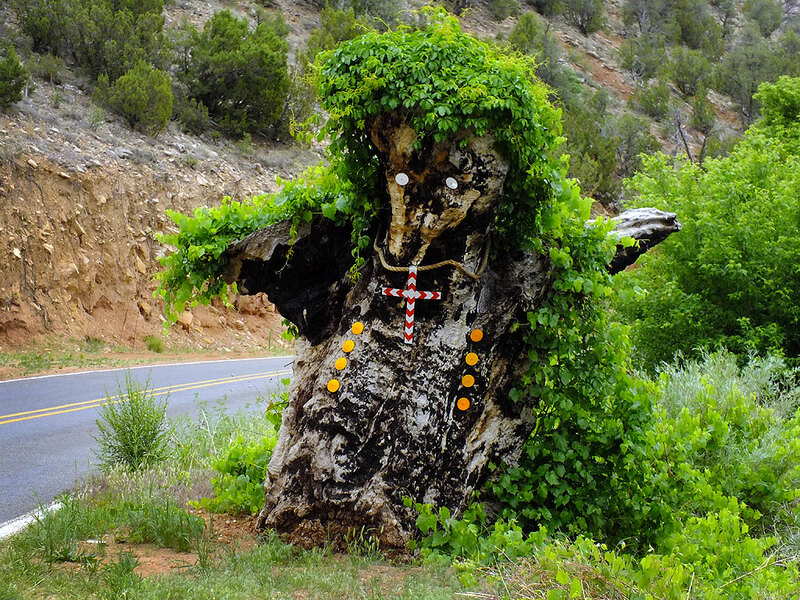 This tree made into a creature (I think it resembles a badger) stands guard along state highway 3 near Ribera, New Mexico. I saw several ruins that were marked in this fashion. 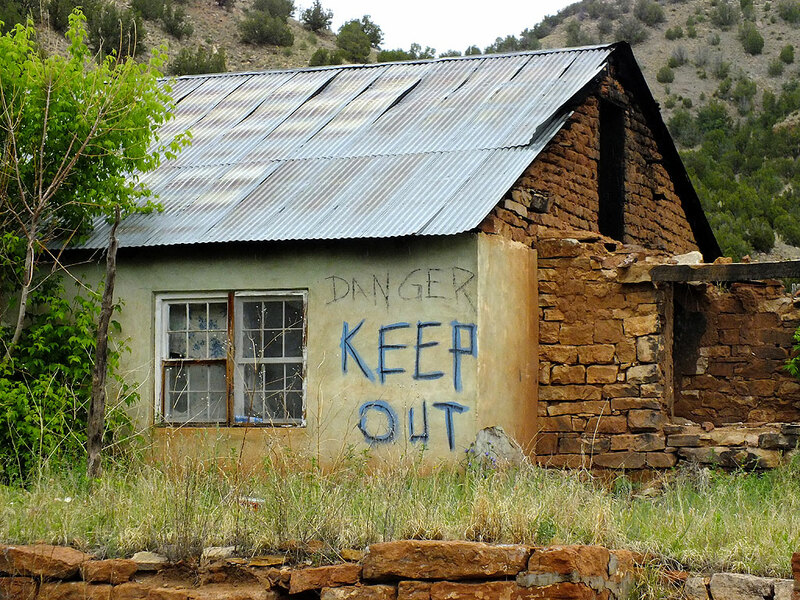 I don’t know if “Keep Out” is a warning of concern for the safety of trespassers, or an expression of privacy. 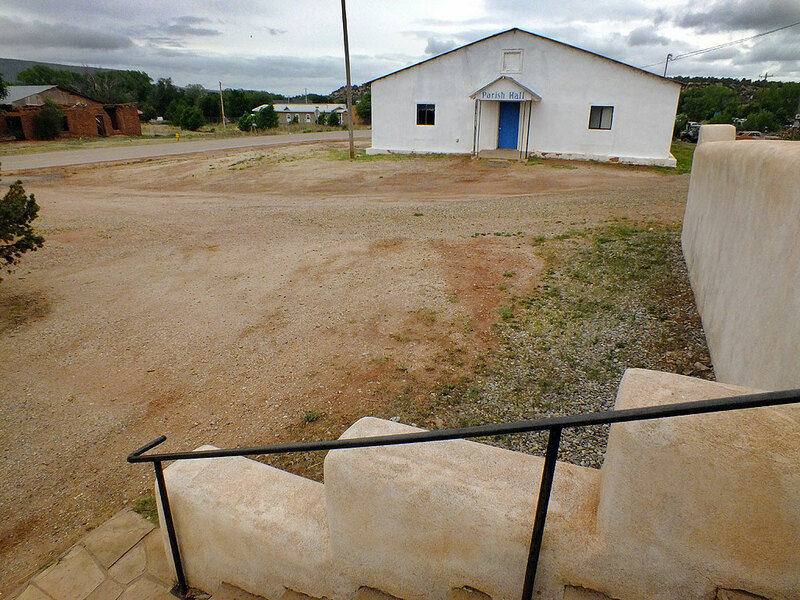 This is the San Miguel del Vado Church in Coruco, New Mexico. 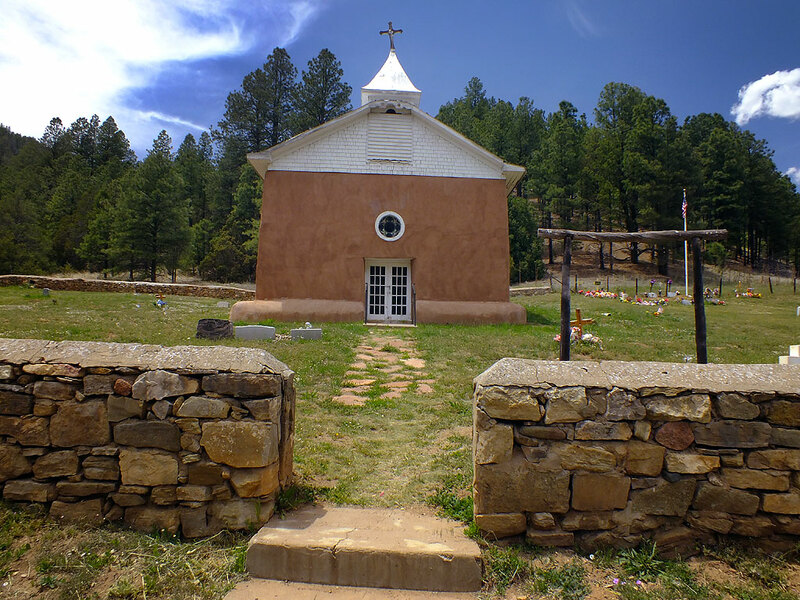 This is another view of the San Miguel del Vado Church in Coruco, New Mexico. 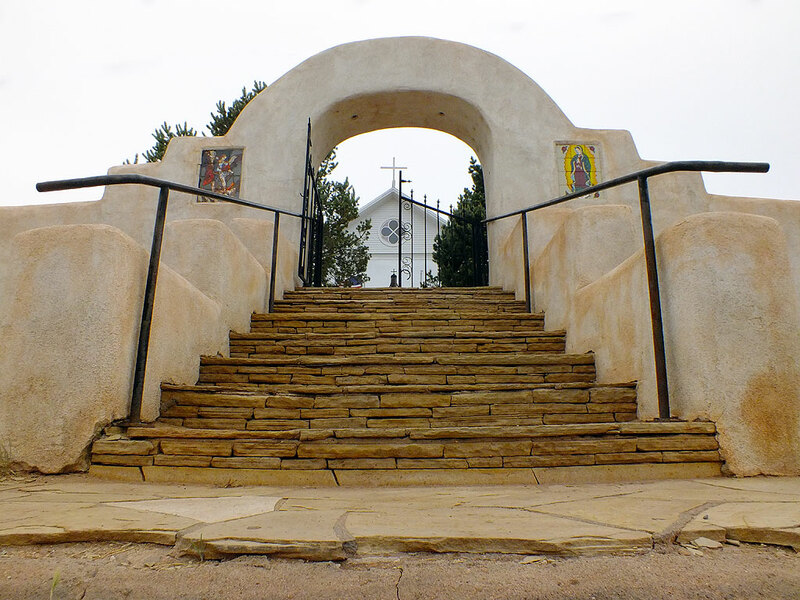 For some reason, this view from the steps of the San Miguel del Vado Church reminds me of a scene from Natural Born Killers. 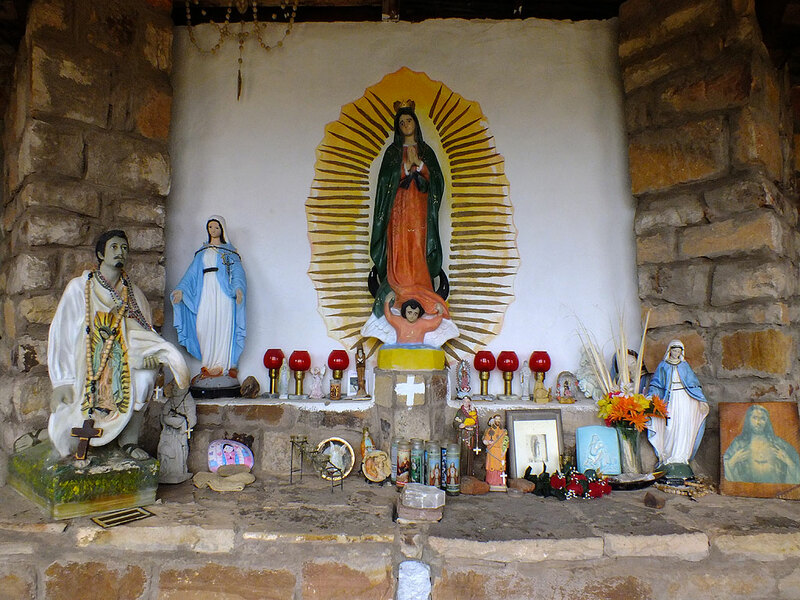 This is La Gruta de la Sagrada Familia (The Grotto of the Sacred Family) in Villanueva, New Mexico. 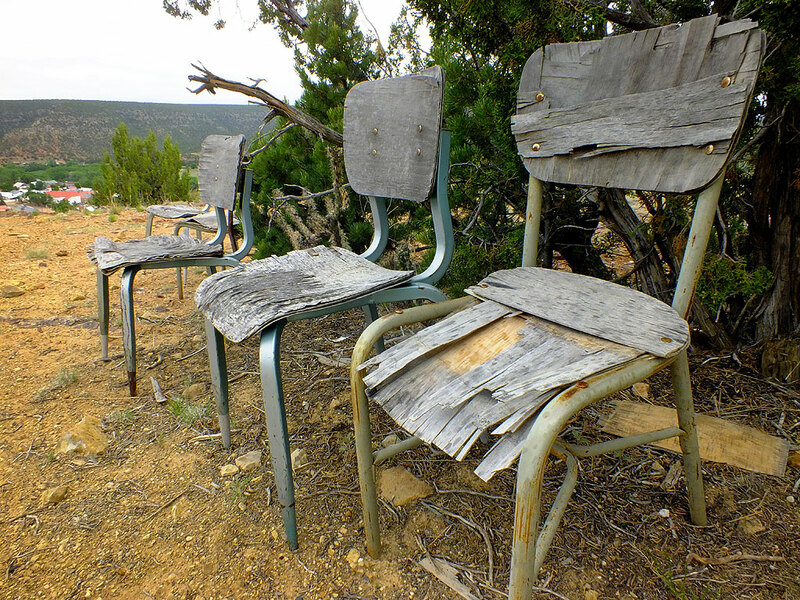 Weathered chairs, presumably in place for visitors or worshippers, sit close to the Grotto at Villanueva. I was sorry to see the Gallegos Cash Store in Villanueva closed, and actually briefly entertained a fantasy about buying it. I distinctly remember photographing this building in Villanueva in 1999 just before being soaked by a sudden downpour. 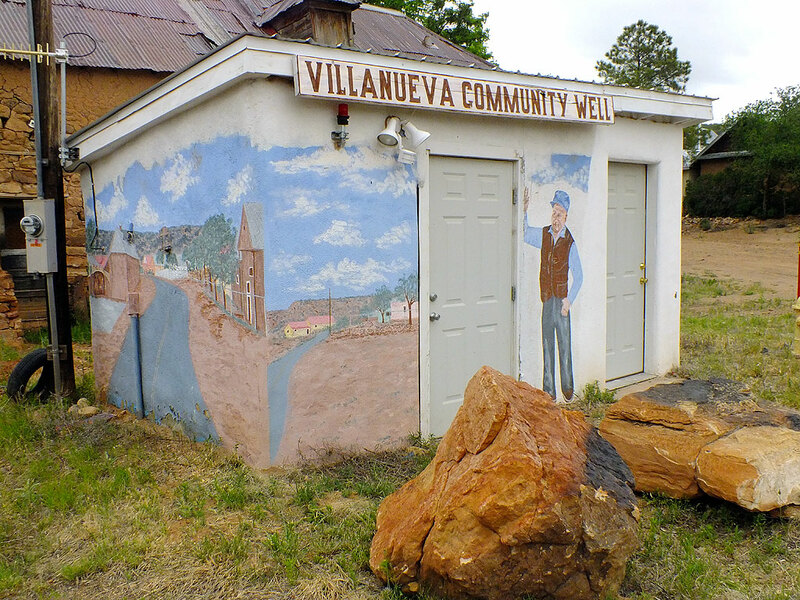 This broad overview from The Grotto shows the lay of the land in Villanueva, New Mexico. 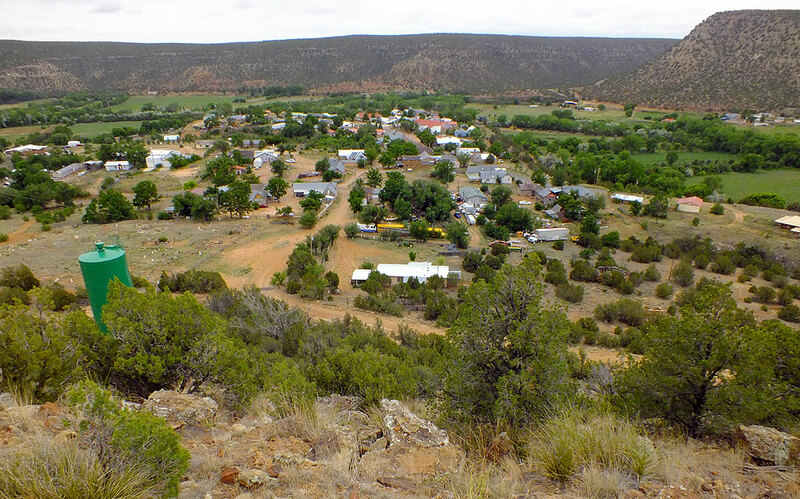 I made this overview of Villanueva, New Mexico from La Gruta de la Sagrada Familia, the grotto on the hill to the north. When they say, “Don’t drink the water,” this is what they mean: when I stayed in Villanueva and drank water from this well, it made me sick. I made a point once I was in Villanueva to drive the hill at the south end of town to photograph The Grotto, the pride of the community. Once there, I found a plaque honoring the late Pete Gallegos, who I met in 1999 to get the key to the borrowed house, and from whom I bought a few groceries. The plaque said he died in 2006 and was 93. 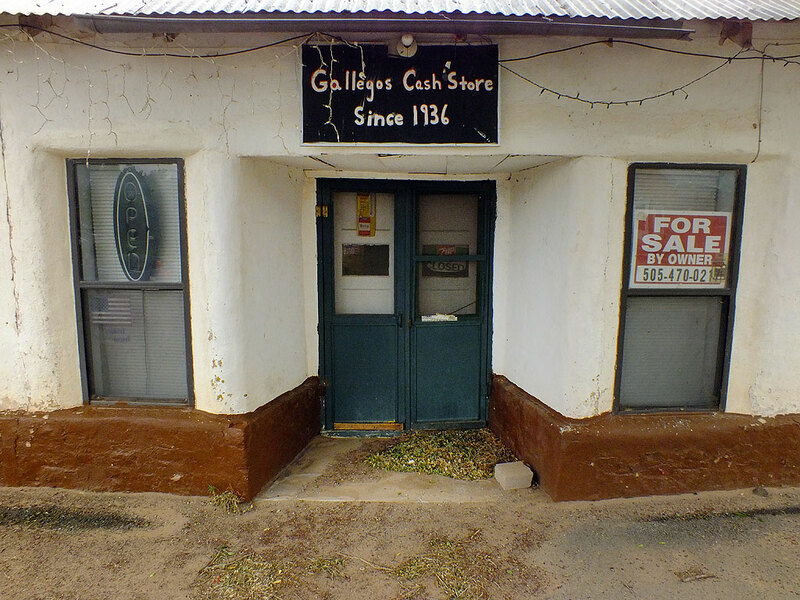 Once in town, I found his store, the Gallegos Cash Store, closed and for sale. 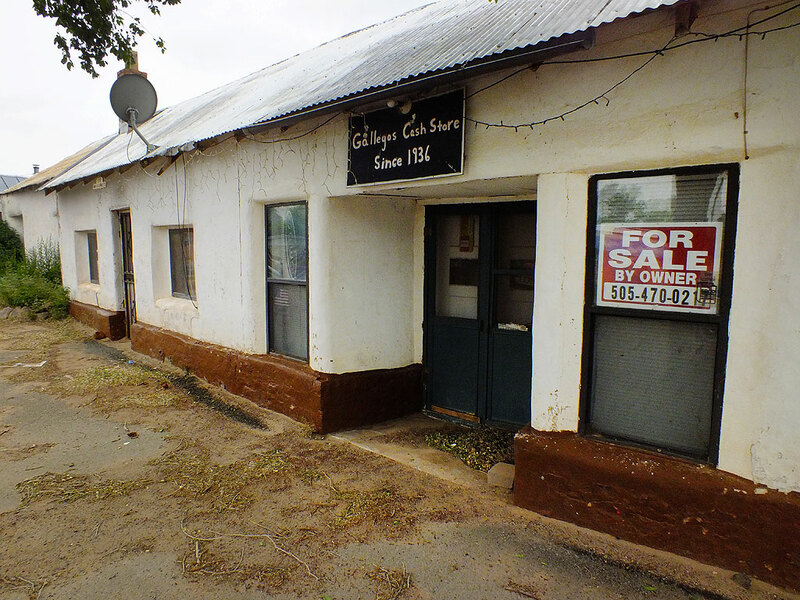 Gallegos Cash Store in Villanueva is closed and for sale. In 1999, I bought supplies here from the late Pete Gallegos. 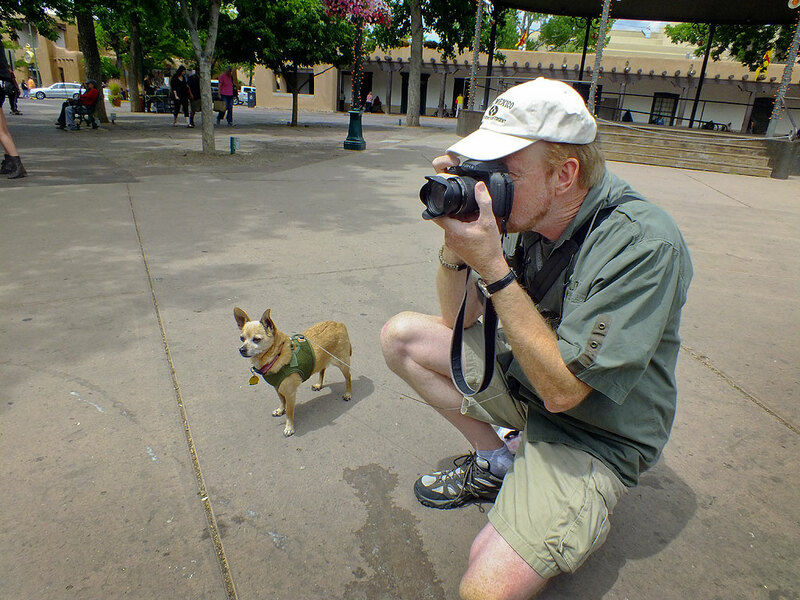 With Max the Chihuahua on a leash clipped to my belt, I photograph activities on the historic Plaza in Santa Fe, New Mexico. 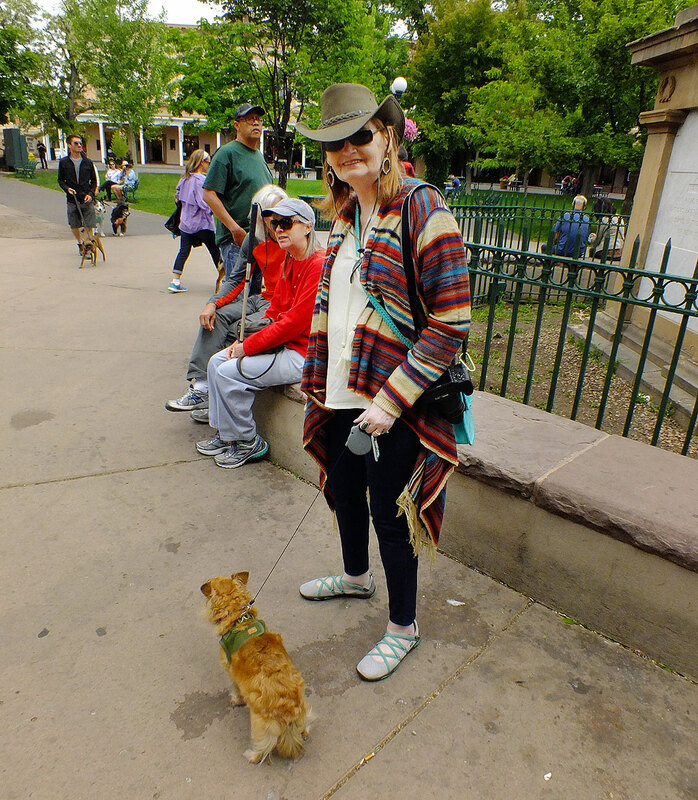 Back in Santa Fe, Abby and I loaded up the dogs for a walk around the historic Plaza. 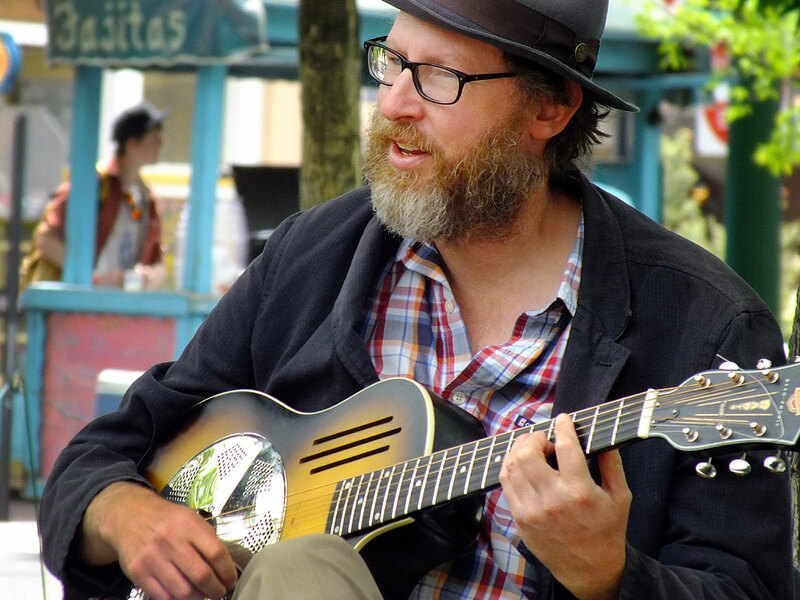 We saw and photographed the usual sights, including a talented jazz group called The Speakeasy Jazz Cats. Abby got a few more souvenirs. The dogs were adored by everyone they passed. This is one of Abby’s images of the Speakeasy Jazz Cats, the musicians we saw performing on The Plaza in Santa Fe. … and this is the image she made. 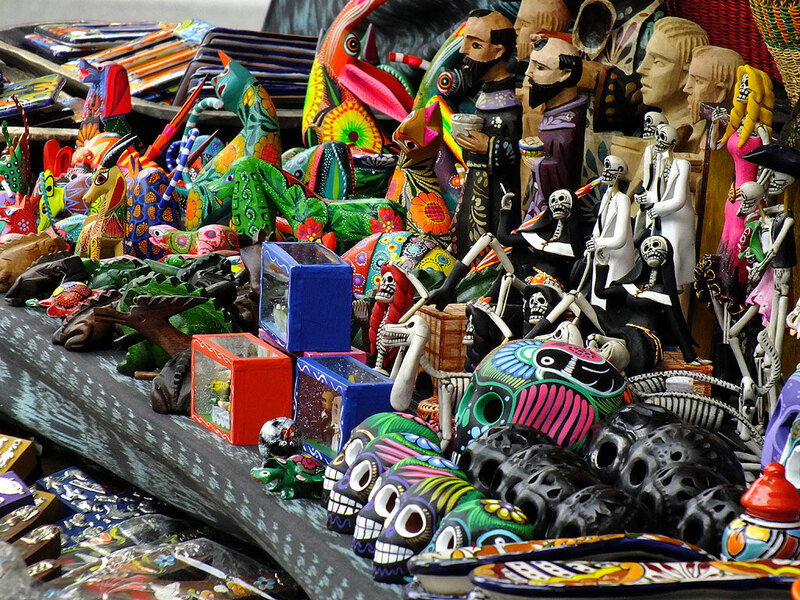 One of our favorite things about making pictures in the American Southwest is that everything tends to be very colorful, like this display of items for sale on The Plaza. … and this was the shot I was making. 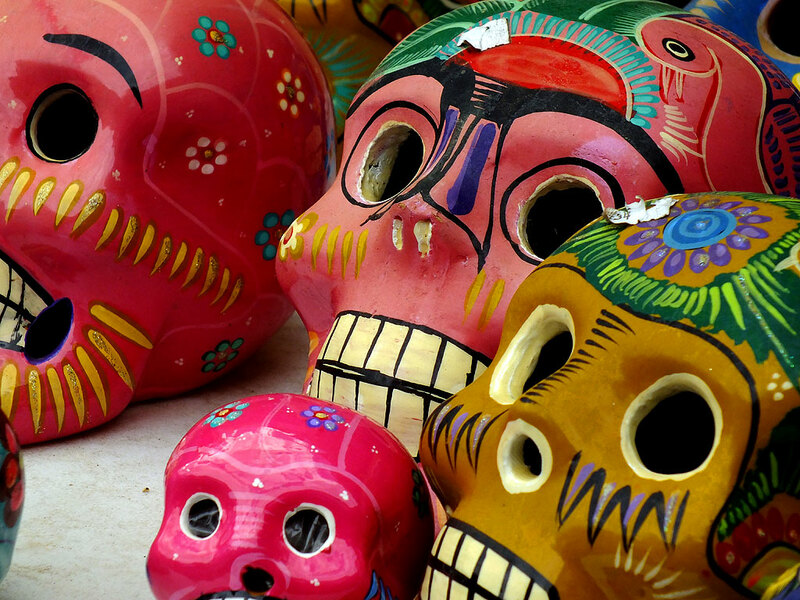 Traditional skull art sits on a table at a shop on The Plaza. 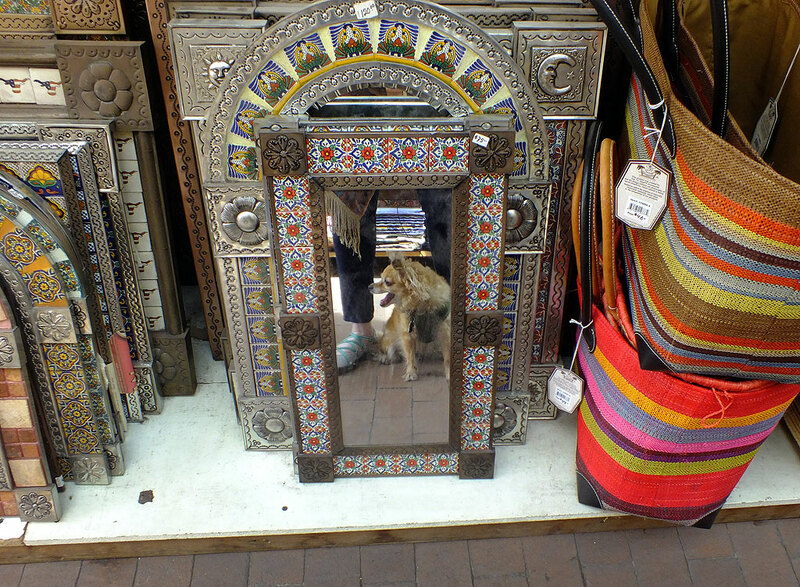 Abby made a shot like this, of her dog Sierra in a mirror, in 2010, so I encouraged her to shoot it again, in the same spot, six years later. Abby smiles as she is back in one of her favorite places, Santa Fe’s Historic Plaza. The music group playing when we arrived was called the Speakeasy Jazz Cats. We liked their sound. 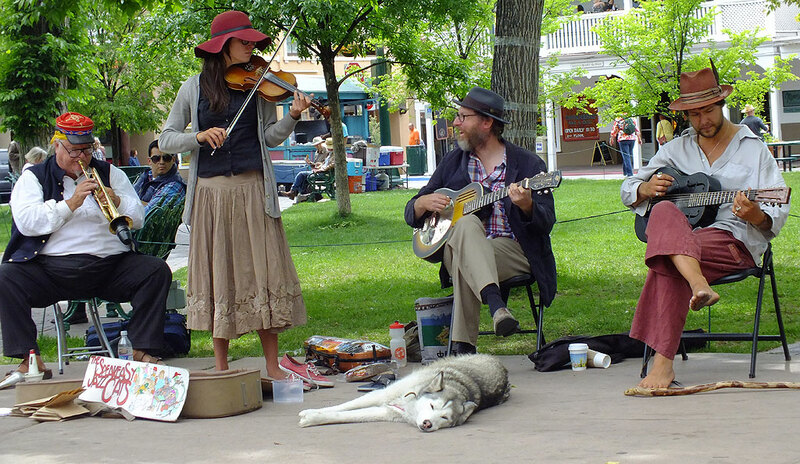 The Speakeasy Jazz Cats play for the crowd on Santa Fe’s Historic Plaza. The music group had this sleepy dog with them, which was friendly and wanted to be petted after the Jazz Cats were done with their show. These two woman enjoyed the music on The Plaza and danced the whole time. 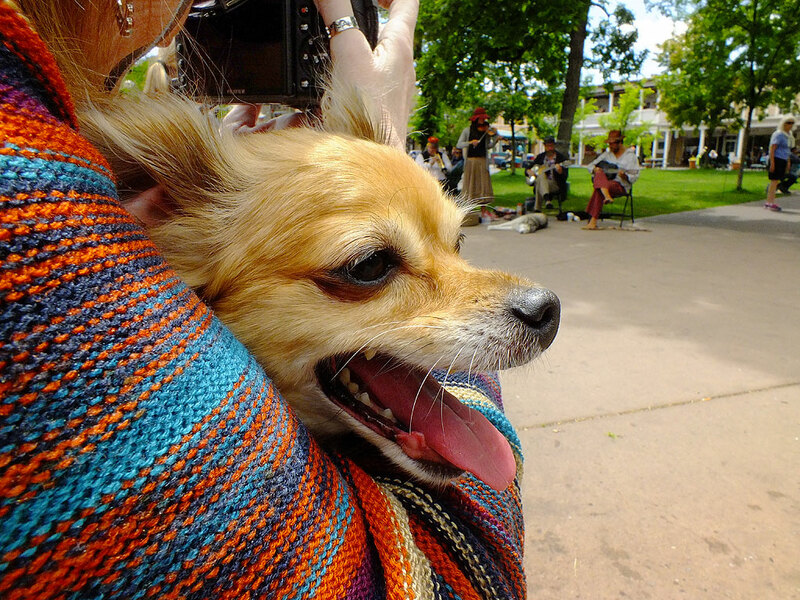 Sierra the Chihuahua enjoys the sights and sounds of The Plaza. 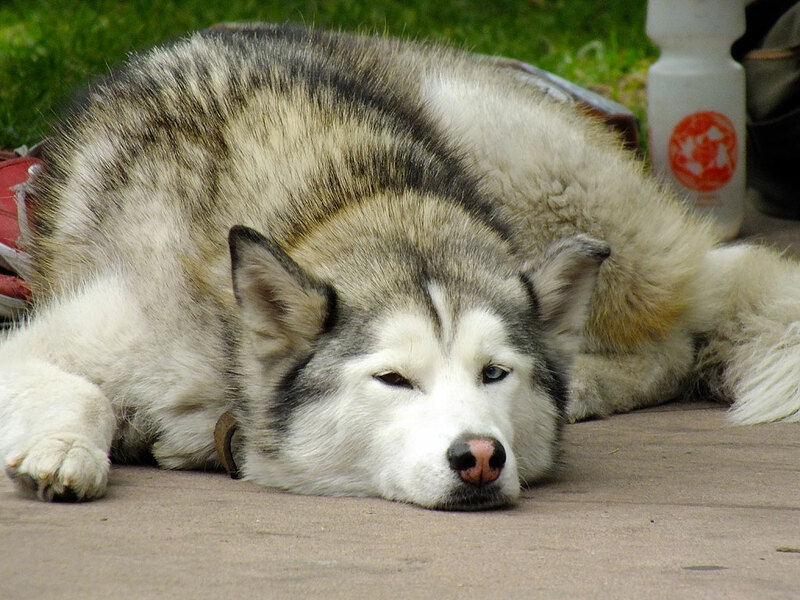 Both dogs behaved well and were admire by many visitors. “This way, honey!” I lead the way on a stroll around the vicinity of The Plaza. 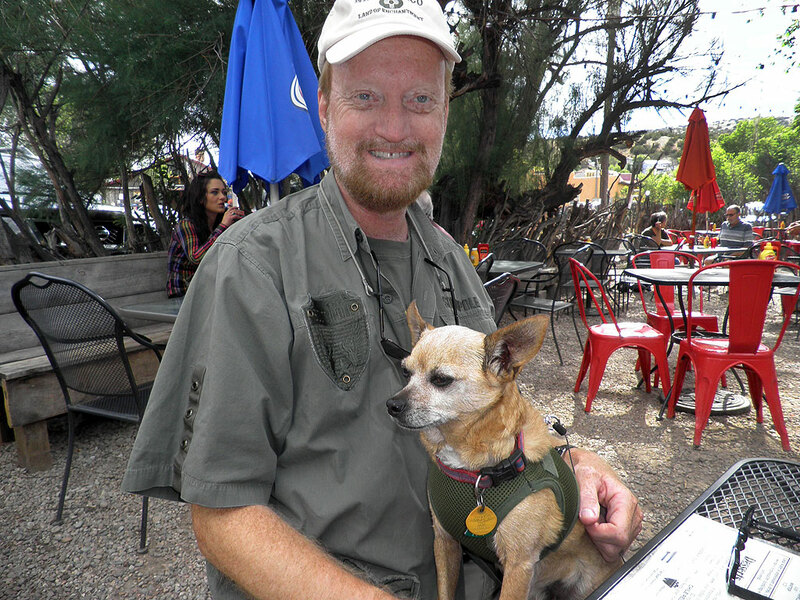 Max sits in my lap as at The Hollar as we wait for our late lunch. Later in the afternoon, we drove down to Madrid. 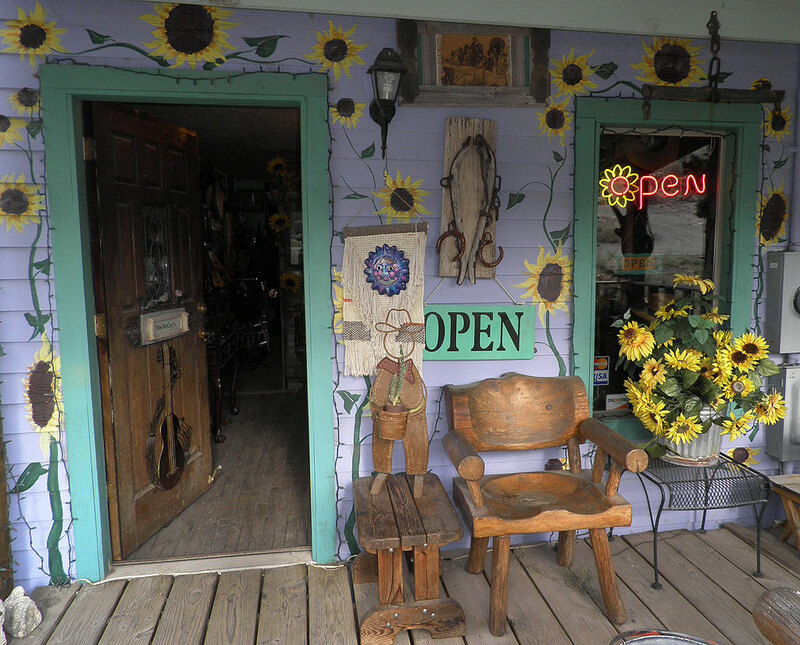 Readers might recall that this tiny town is an art and crafts mecca or sorts, and very dog friendly. In 2014, Abby and I had lunch at The Hollar, when she declared, “I could live here.” Returning 20 months later and again dining at The Hollar, we weren’t disappointed. 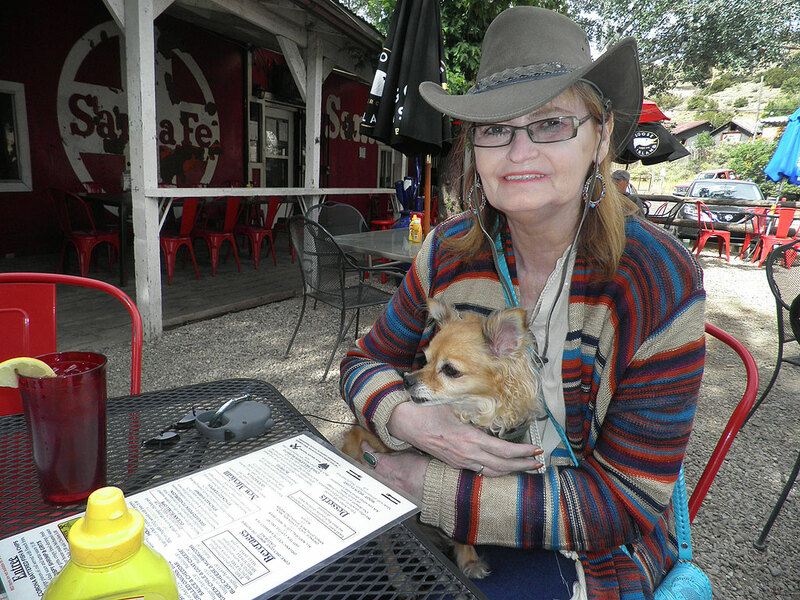 Abby holds Sierra in her lap at The Hollar, our favorite restaurant in Madrid, New Mexico. 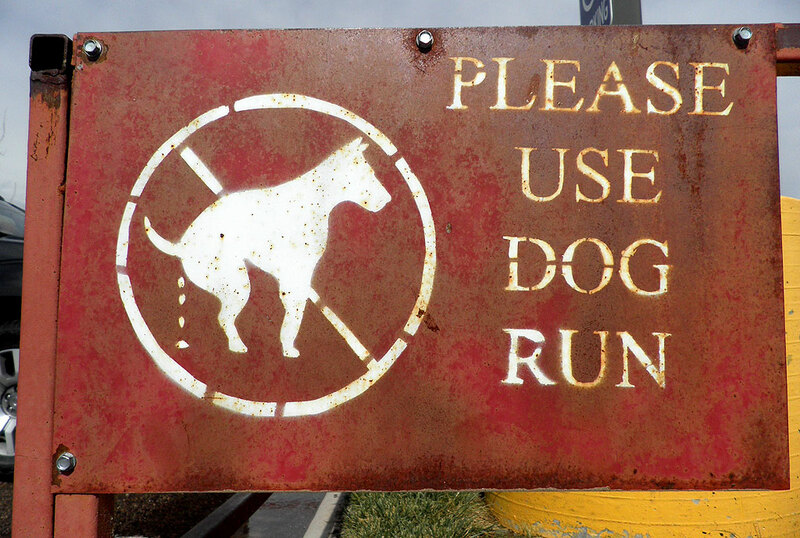 This sign greets visitors to Madrid, New Mexico, one of the dog-friendliest places we have ever visited. 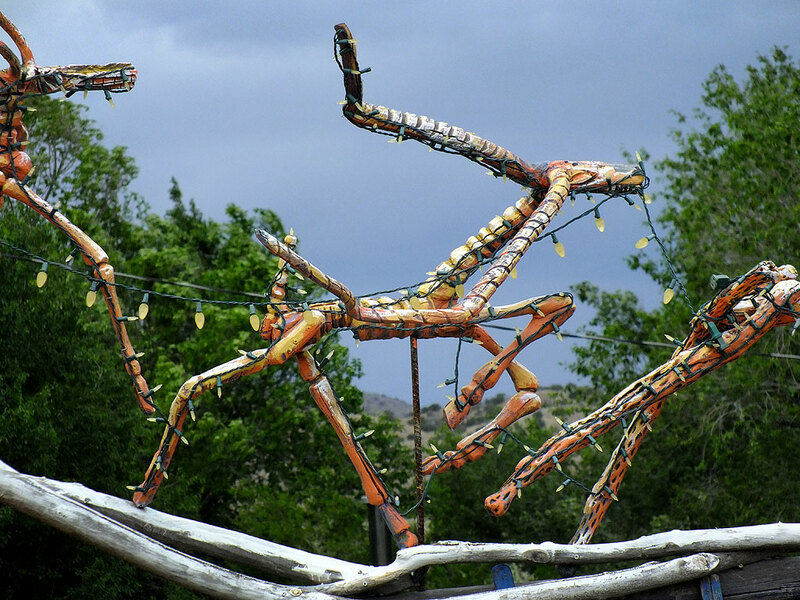 I made this image at The Hollar, the restaurant in Madrid, New Mexico where we had lunch. Abby bought two leather vests for herself at this Madrid shop, The Real McCoy’s. 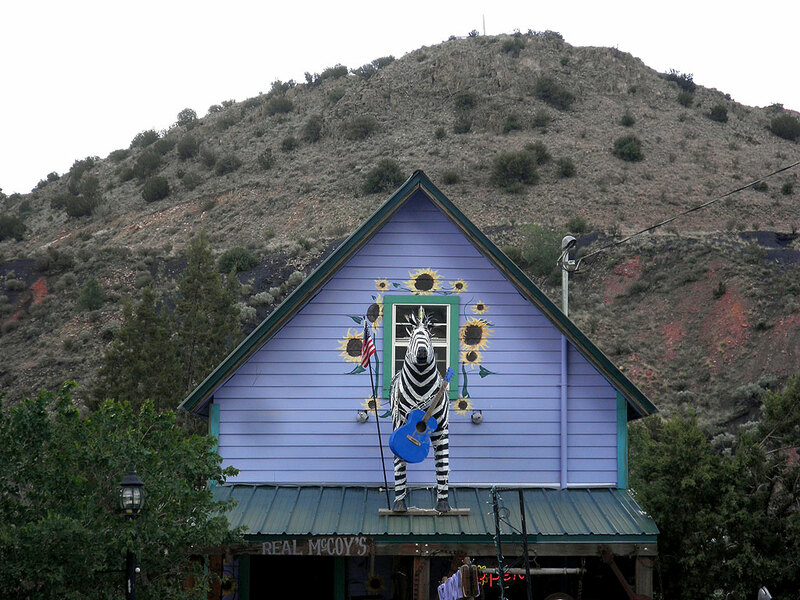 The second story of The Real McCoy’s features a zebra with a guitar. 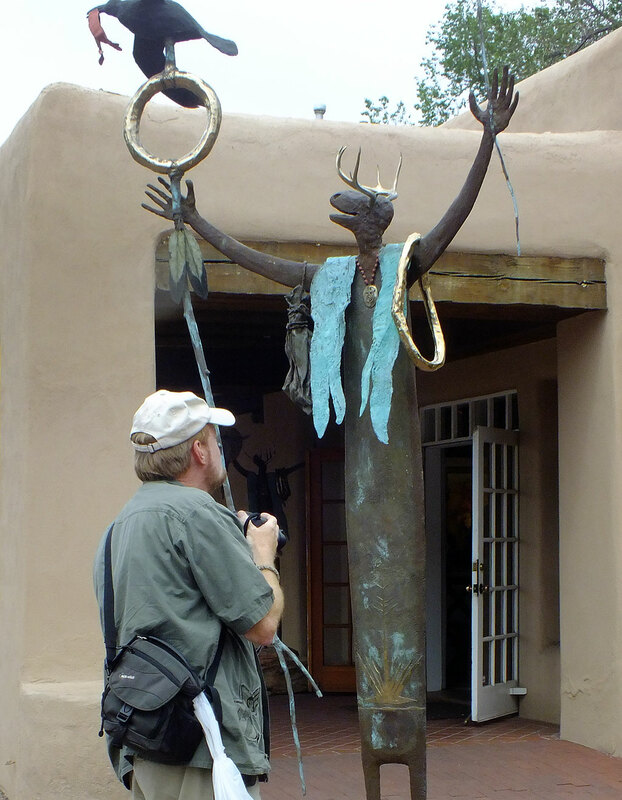 After lunch in Madrid we headed back in the direction of Santa Fe, but took the time to explore sites along New Mexico 14. 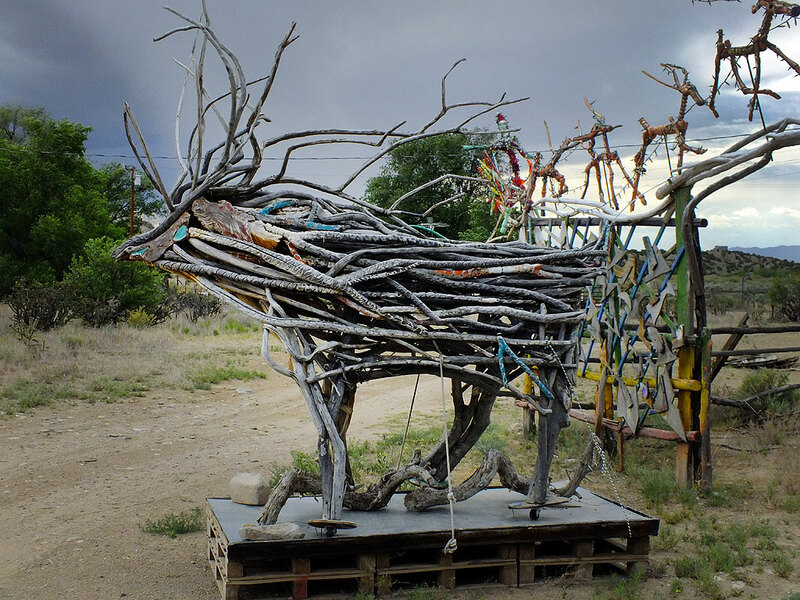 I have to admit that a caribou made from sticks is pretty neat. 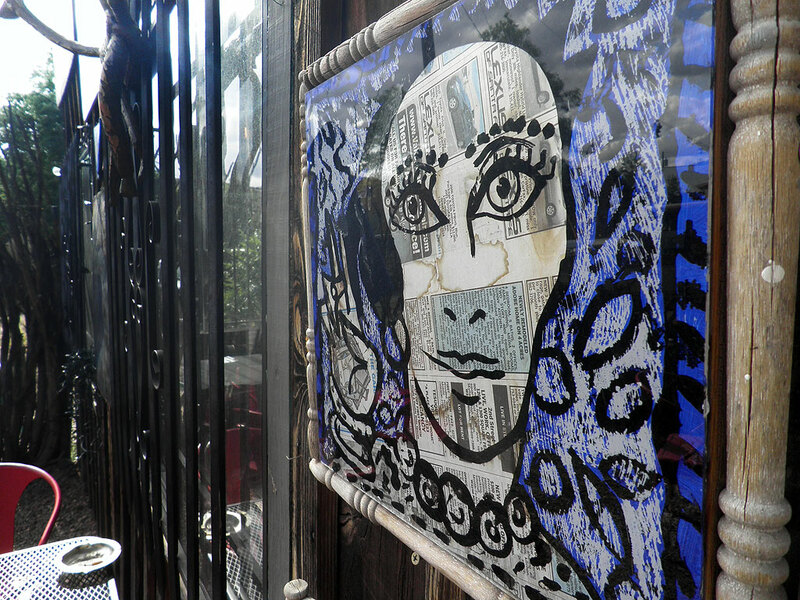 A fence is covered in art north of Madrid. 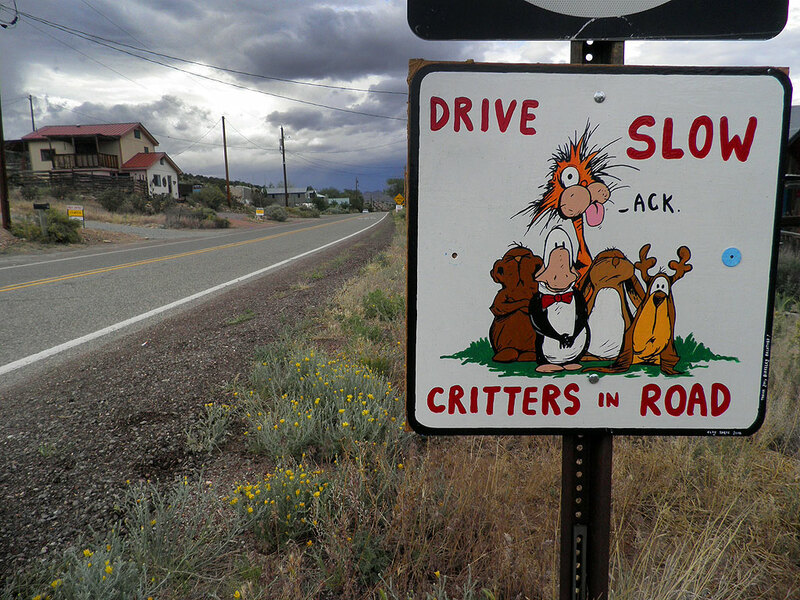 Despite this inviting sign by the road, we didn’t see anyone at this location north of Madrid. Another creative sign along NM14 north of Madrid seems to invite visitors, but the road leads to a residence where the occupant seemed annoyed that we approached. Finally, Abby bought a couple of leather vests for herself at a place in Madrid called The McCoy’s. 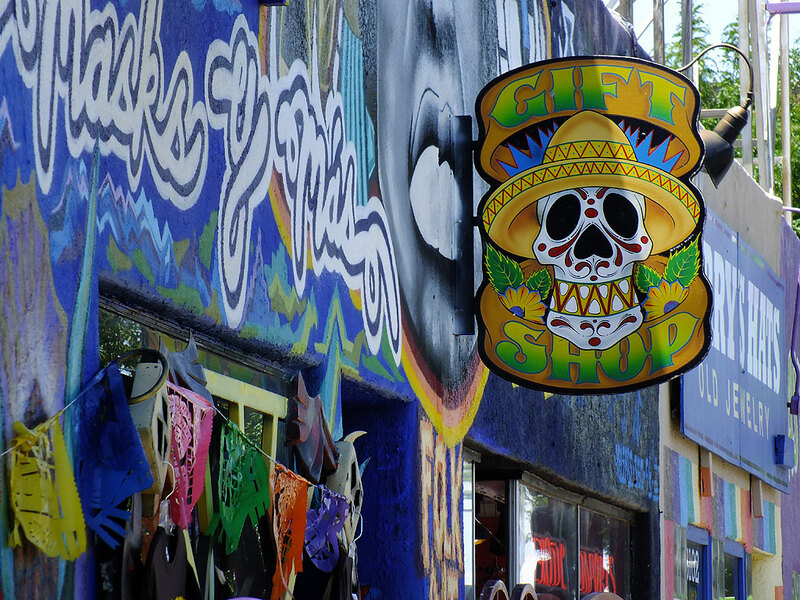 This colorful tattoo parlor stood out during our drive through Albuquerque, New Mexico. 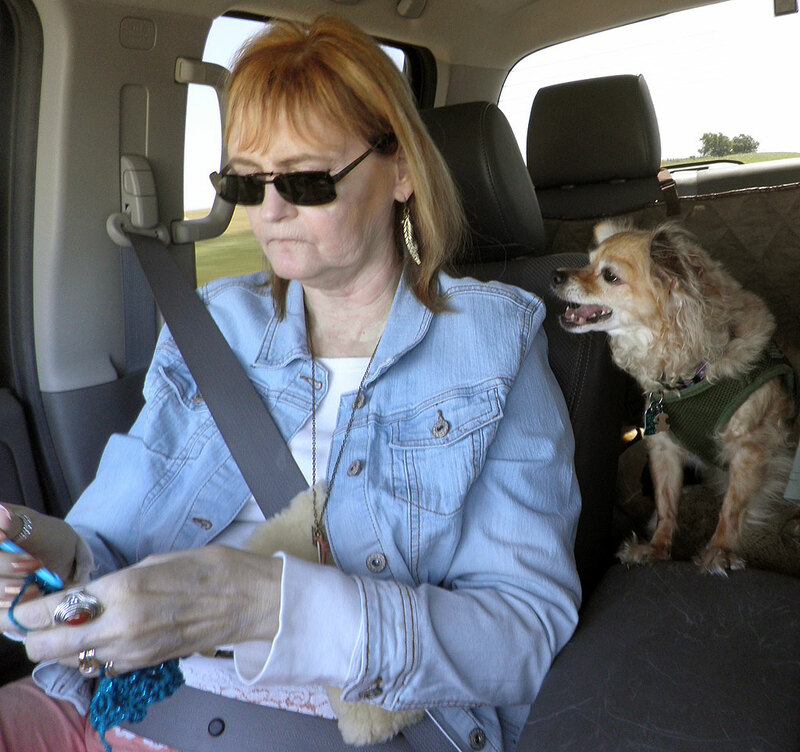 While Max the Chihuahua was perfectly happy to nap on the dog-proof cover in the back seat, Sierra constantly wanted to be in Abby’s lap as you can see here, despite Abby wanting to crochet for much of the trip. Looking for something fun to do as we started to ease our way toward Oklahoma, we drove southwest from Santa Fe to Albuquerque. 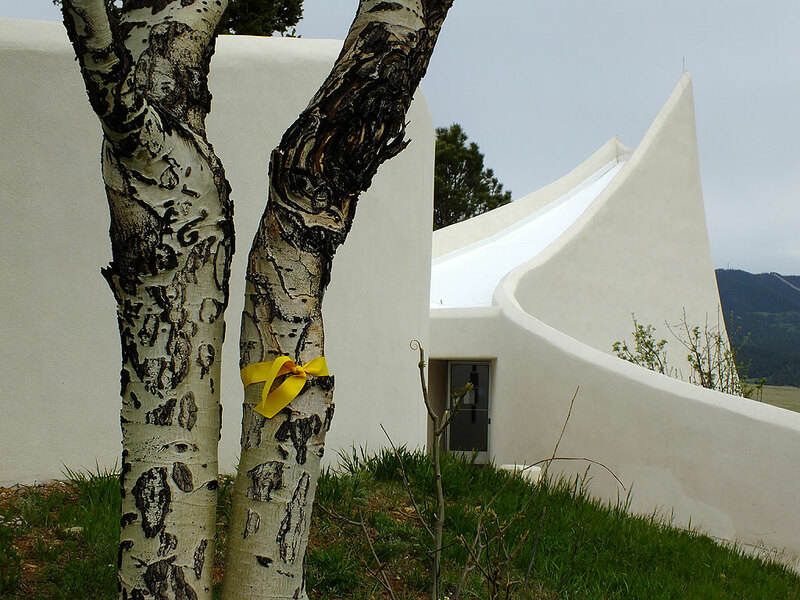 Remembering some interesting avant garde architecture we saw on The High Road in 2003 along Central Avenue near the University of New Mexico (after taking a wrong turn trying to find the Sandia Peak Aerial Tramway), we drove the route from west to east. The area appeared to have taken a turn for the worse in 13 years, though I noted that it might be more interesting at dusk. At my urging we drove to Sandia Peak. 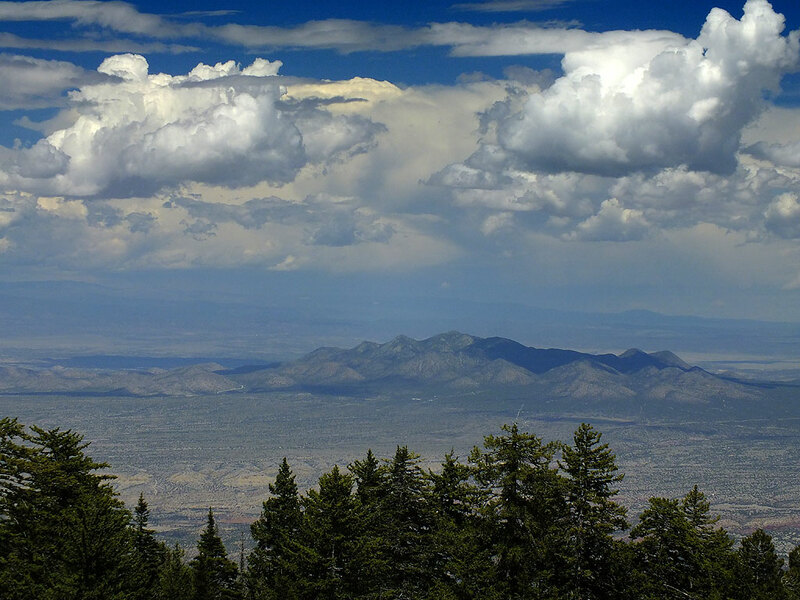 The view from Sandia Peak was great, as in this image looking east. 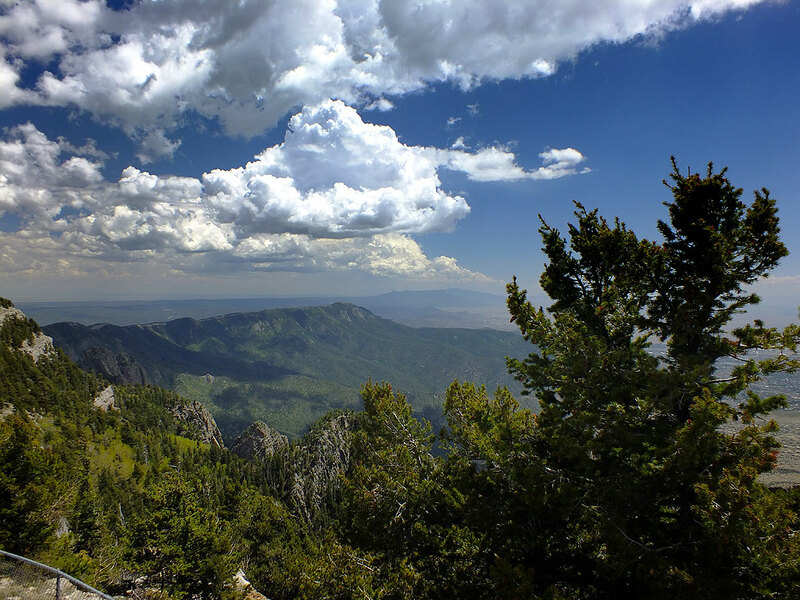 It’s always a pleasure to go to the top of Sandia Crest and enjoy the views and the fresh air. This view looks south. 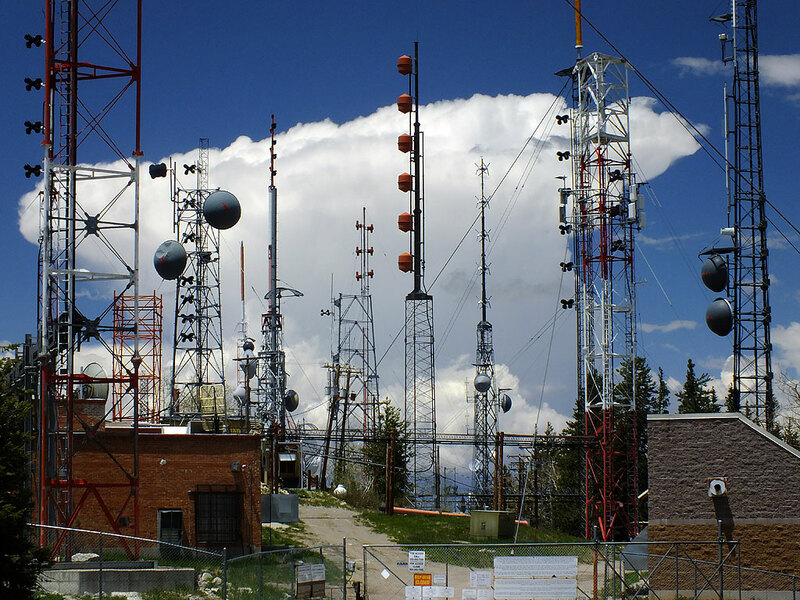 This is the antenna farm on Sandia Peak. In our home state of Oklahoma, you can’t get anywhere near antennas like this because they’re all on top if 1500-foot towers. The day was beautiful and sunny, and Abby was taken aback by the alpine scenery. We only stayed for a few minutes at the top, but long enough for Abby to grab a few more souvenirs and for me to make some images, including of the impressive antenna farm. 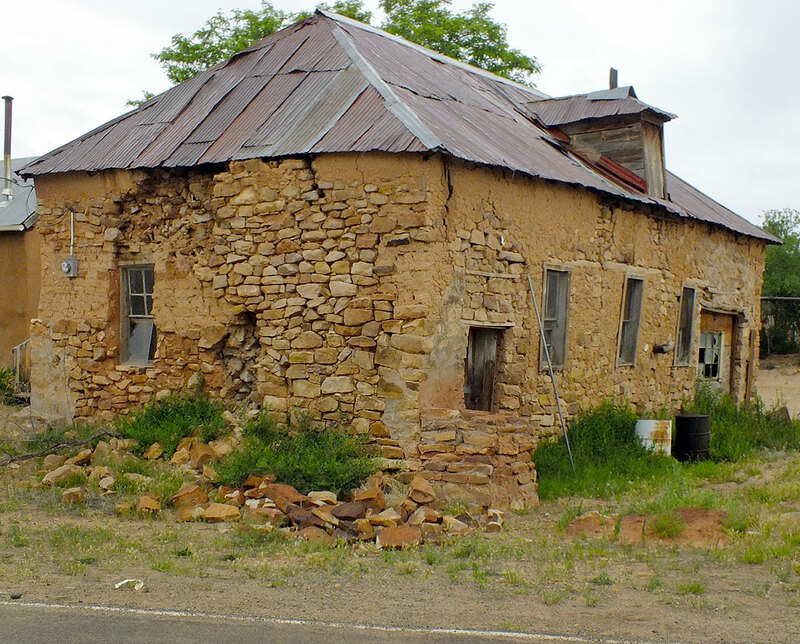 As the years have passed, I have watched this Pioneer Museum, which we call the “Plague Town” because it looks like it was decimated the same way Piedmont, New Mexico was in The Andromeda Strain, fall apart more and more. 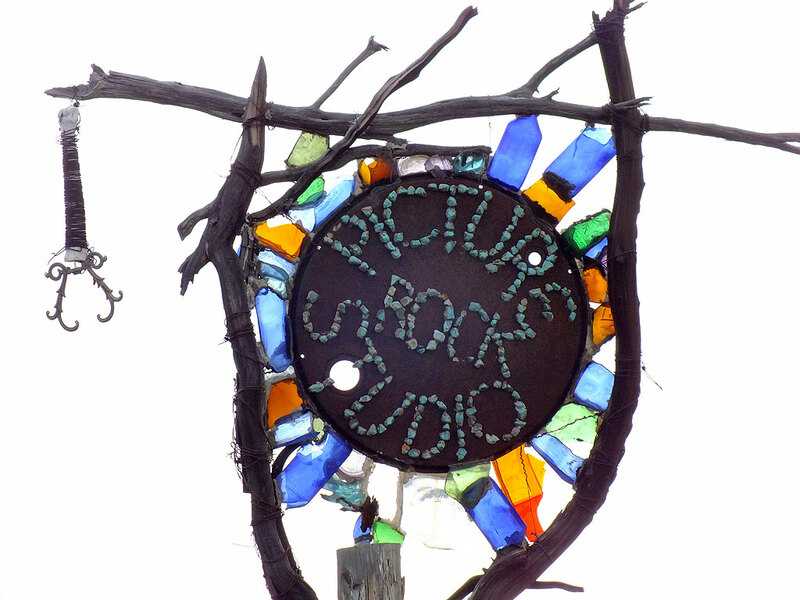 We stop here, at exit 284 east of Santa Rosa, about every three or four years to make pictures. Farther down the road I decided it was again time to stop at the abandoned Pioneer Museum, which I nicknamed the “Plague Town” years ago because of its deserted, spooky feeling. 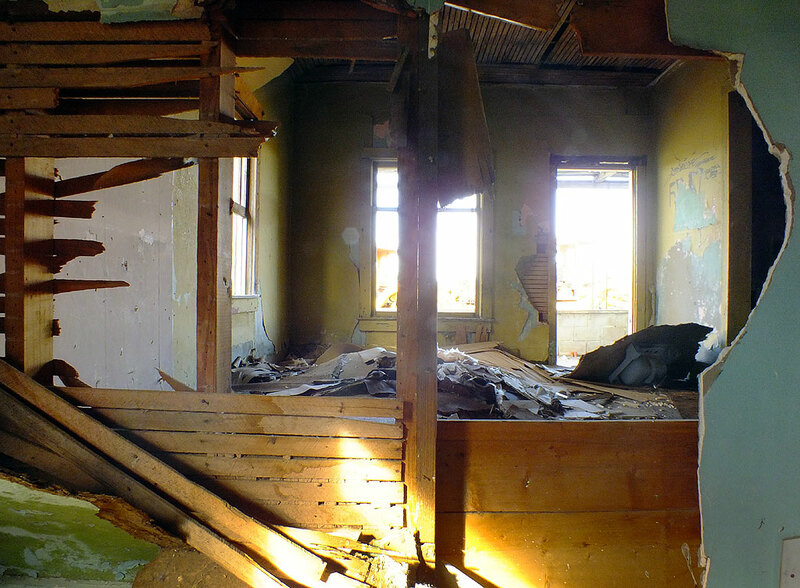 On this occasion, I managed to cautiously explore the house in the yard behind the falling-down museum, though with my hand on my sidearm at every turn. 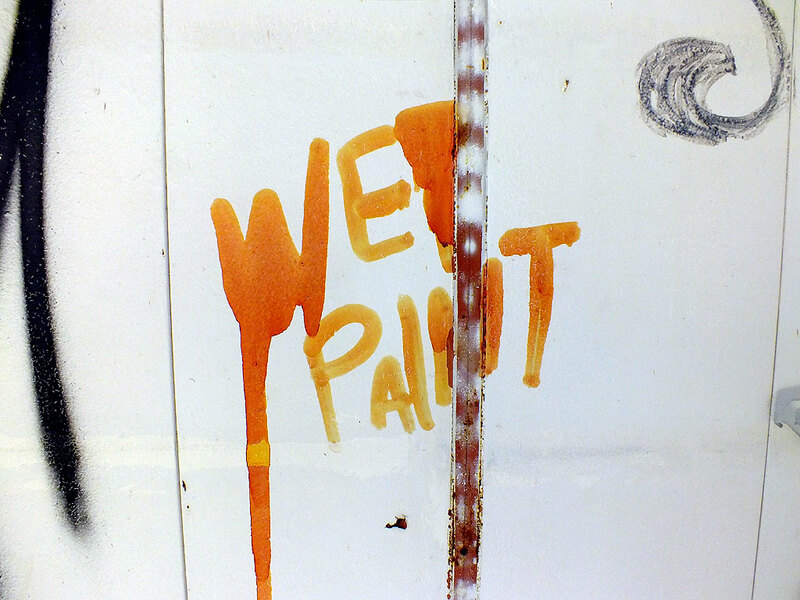 Not only did it make great images, I found an enormous amount of interesting, though often vulgar, graffiti in the house. This was one of the funnier, less-vulgar pieces of graffiti at the Plague Town. 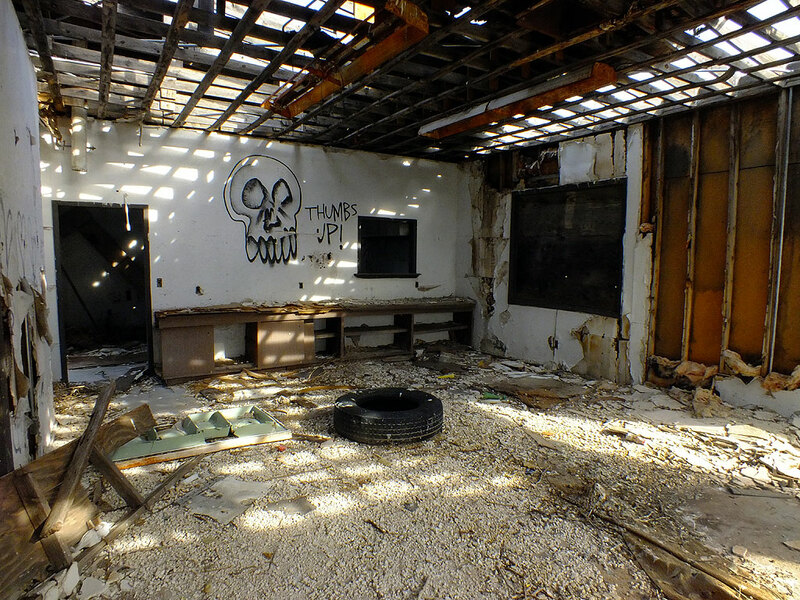 Prowling the Plague Town yielded some interesting results, including the inside of the filling/service station. 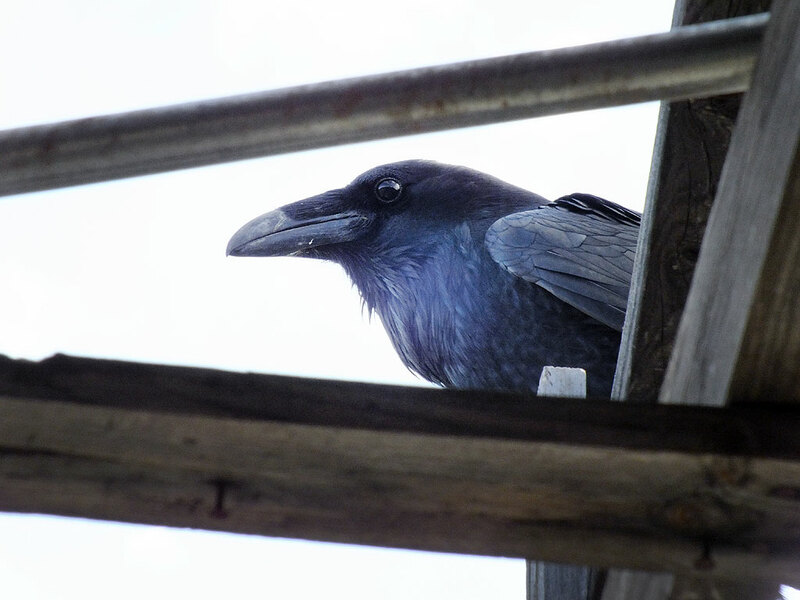 Huge crows had built a giant nest at the Plague Town, and noisily, nervously guarded it. 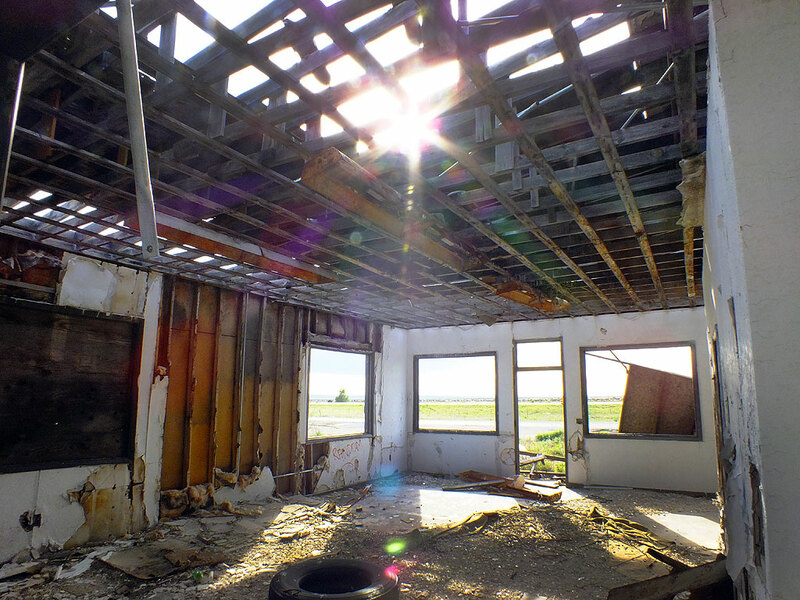 Sunlight streams through the broken, falling-down roof of the filling station at the Plague Town. 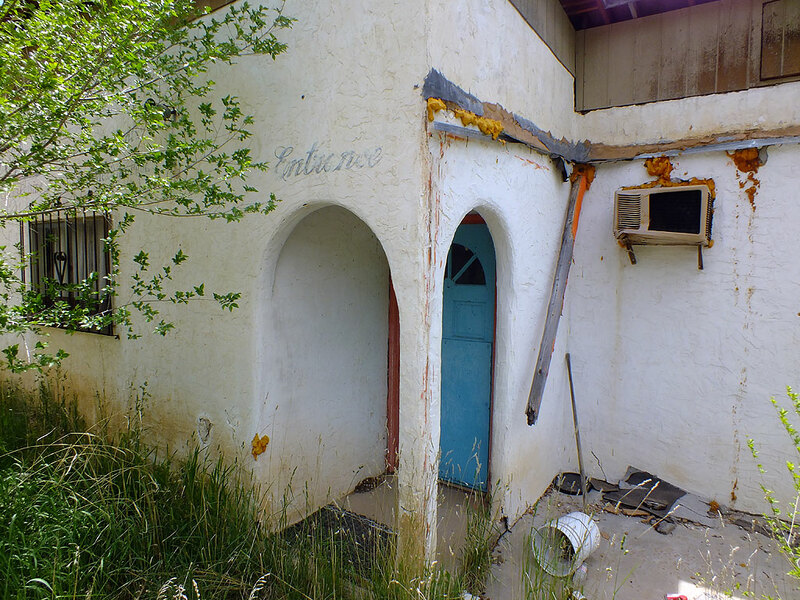 The house behind the abandoned Pioneer Museum/Plague Town was at least as interesting as the filling station. 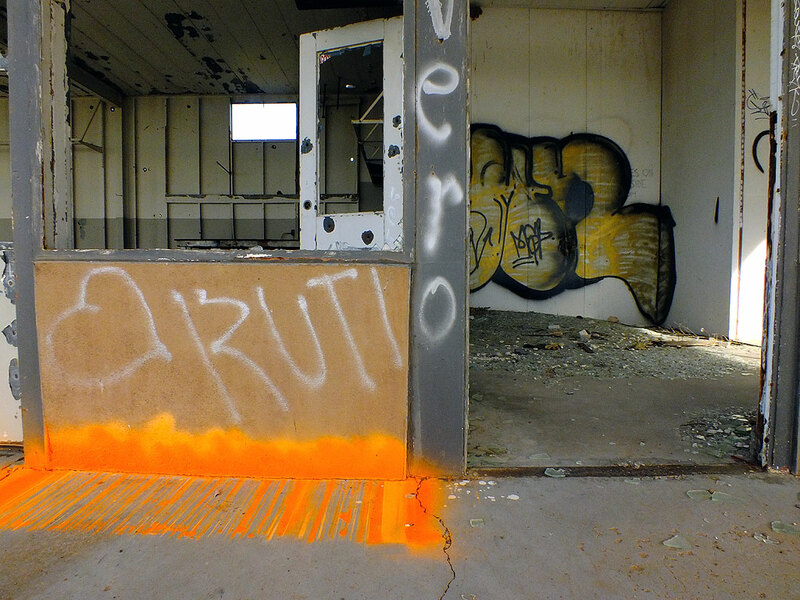 I found the Plague Town’s graffiti particularly interesting. 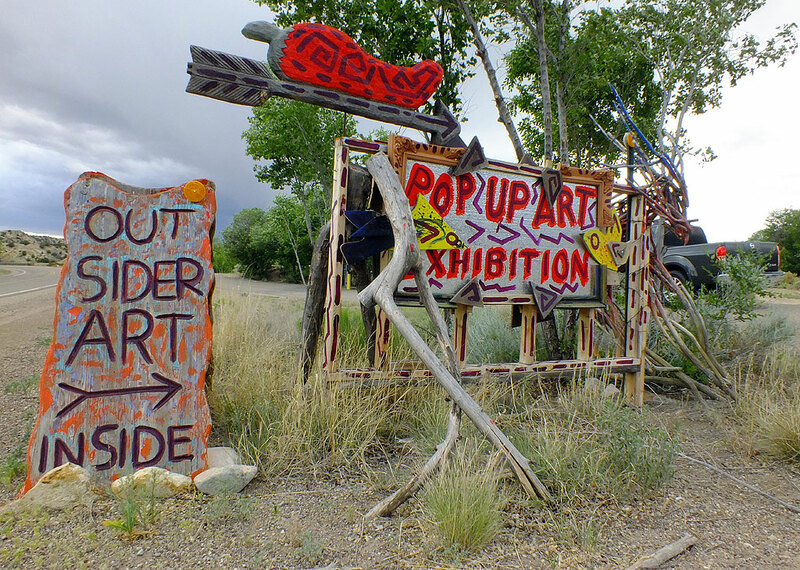 Our truck sits outside the Plague Town, an abandoned Pioneer Museum east of Santa Rosa, New Mexico on Interstate 40. 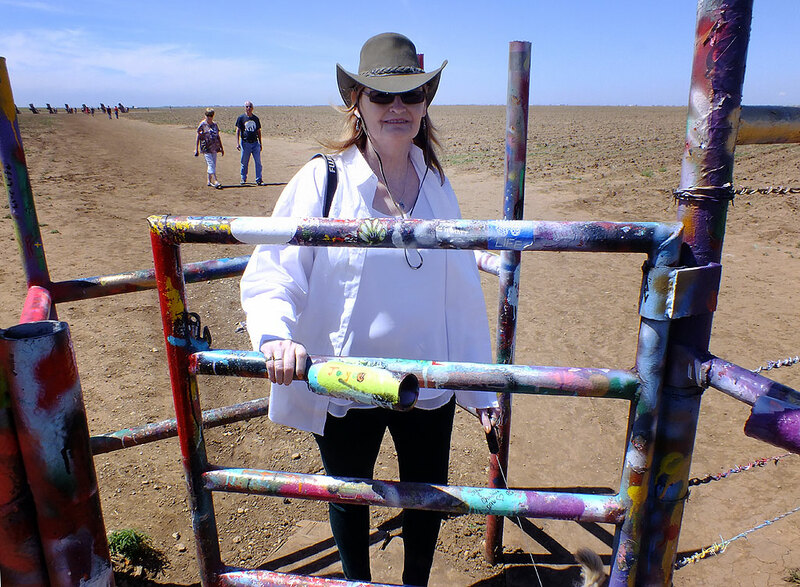 Abby squeezes through the gate at Stanley Marsh’s Cadillac Ranch in Amarillo, Texas. 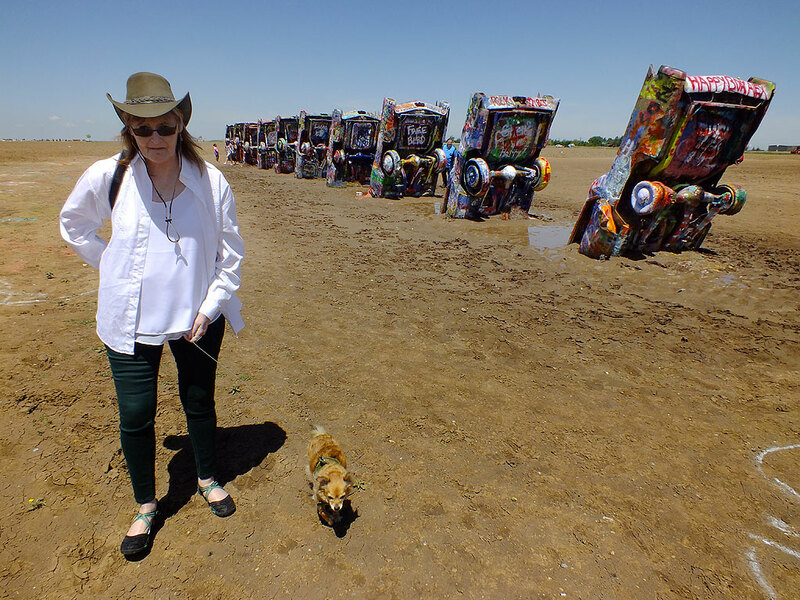 Readers know that I have stopped at Stanley Marsh’s Cadillac Ranch west of Amarillo, Texas on a number of occasions, at first out of curiosity, then later because it was near a convenient place to pee. Abby and I brought the dogs and made a few images. It was quite muddy. 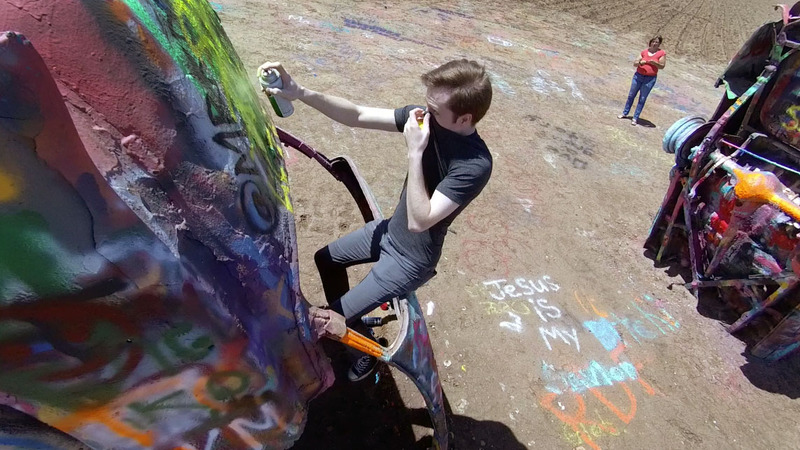 A fellow traveller spray paints one of the Cadillacs at The Cadillac Ranch west of Amarillo, Texas. Abby walks Sierra the Chihuahua past the ten Cadillacs of the Cadillac Ranch. 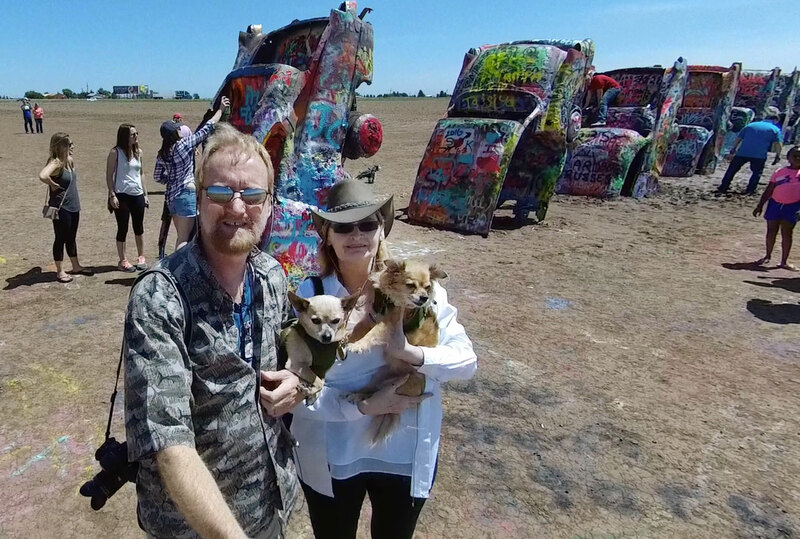 No Interstate 40 road trip seems complete without something from the famous Cadillac Ranch west of Amarillo, Texas. 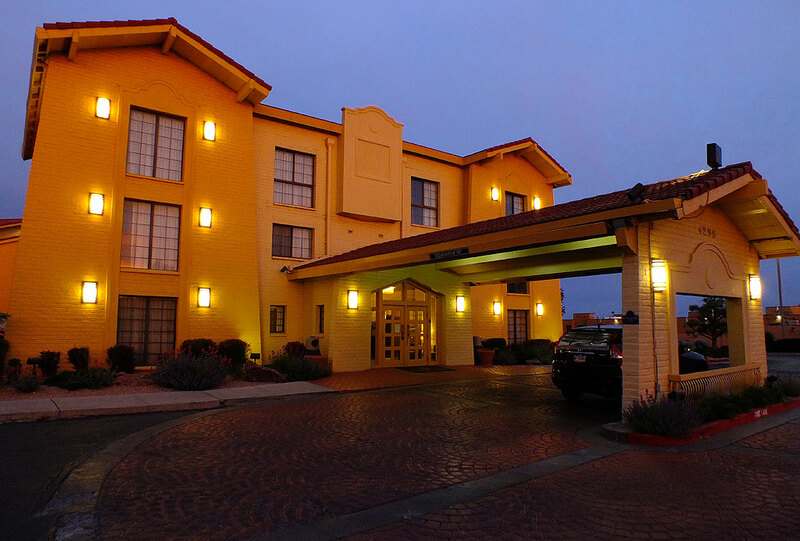 Like everything else, gorgeous evening light can make an ordinary motel, like this La Quinta where we stayed in Santa Fe, look great. We had no problems with our stay. 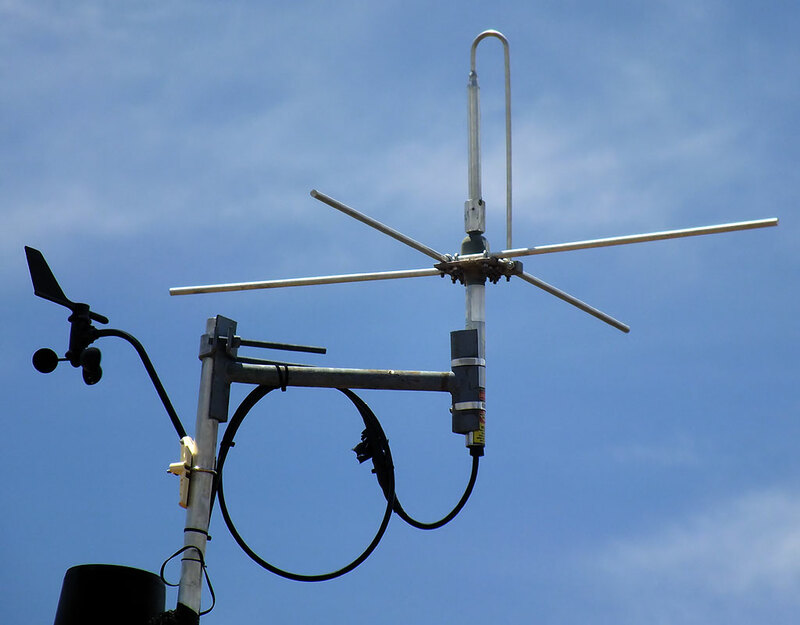 I see this antenna design all the time when we travel, usually at Park Service facilities or at unmanned monitoring stations. 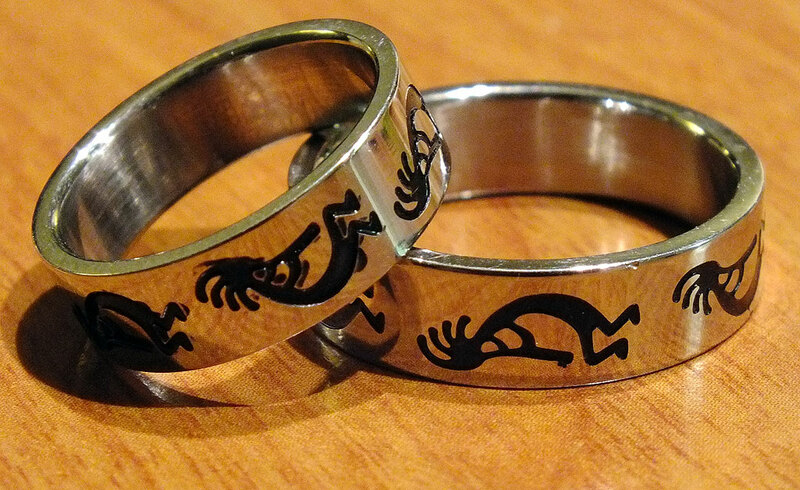 On our first day on the road, Abby and I found these matching stainless steel Kokopelli rings, and wore them every day of the rest of the trip. Abby and I have a tendency to discover and enjoy restaurants that are within walking distance of where we are staying: Moab Brewery in Moab, Utah, the long-defunct Ten Ten Chinese restaurant in Santa Fe, Baltimore’s Bel-Loc Diner, and on this trip, The Flying Tortilla next to our LaQuinta Inn in Santa Fe. 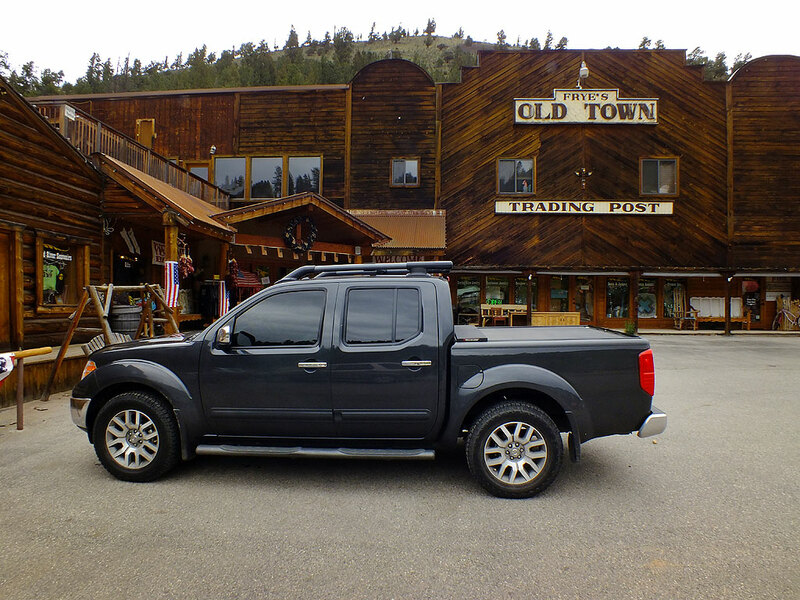 As usual, we drove Abby’s Nissan Frontier SE 4×4, which is still a perfect road trip vehicle for us in every respect: comfortable, spacious, quiet, and quite capable off-road. These were our cameras for the trip: two Fujifilm HS30EXRs and an Olympus FE-5020. Abby and I made almost all of our images using our matching Fuji HS30EXR cameras, plus a few with my tiny Olympus FE-5020 point-and-shoot, which lived in my pocket and was much easier to reach than the Fujis, and delivers better results than our iPhones. 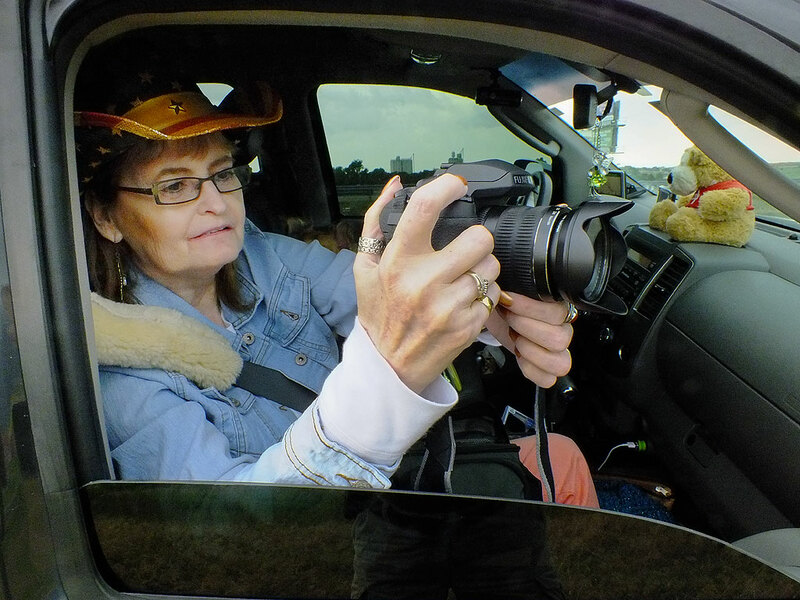 Additionally, I brought my Ion action cam, with which I made a few images, but no video. As always, our Chihuahuas, Sierra and Max, were perfectly happy to be on the road with us. 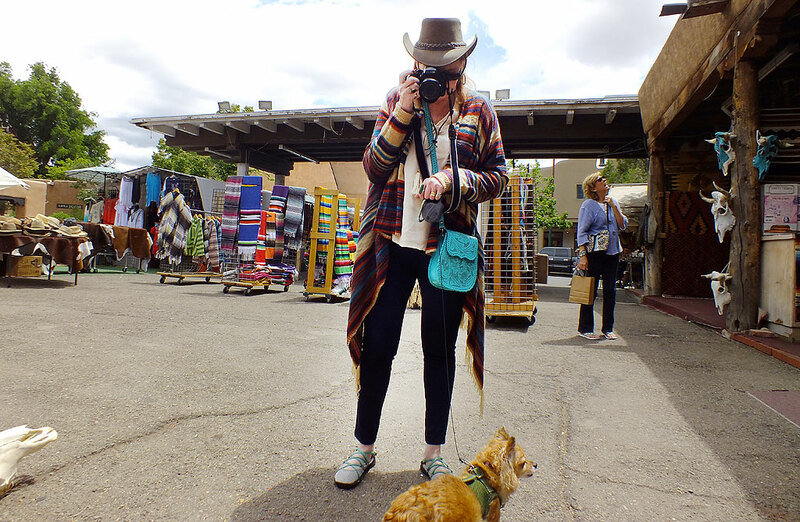 People, particularly in Santa Fe, constantly told us how cute they were. 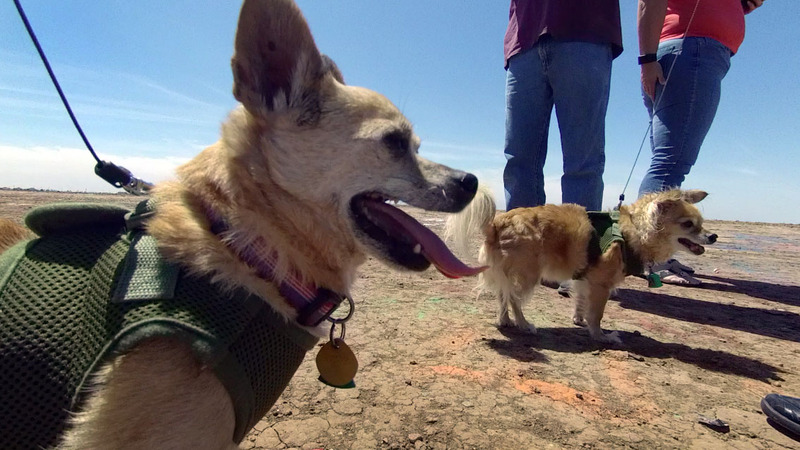 Max and Sierra investigate the Cadillac Ranch in Amarillo, Texas. 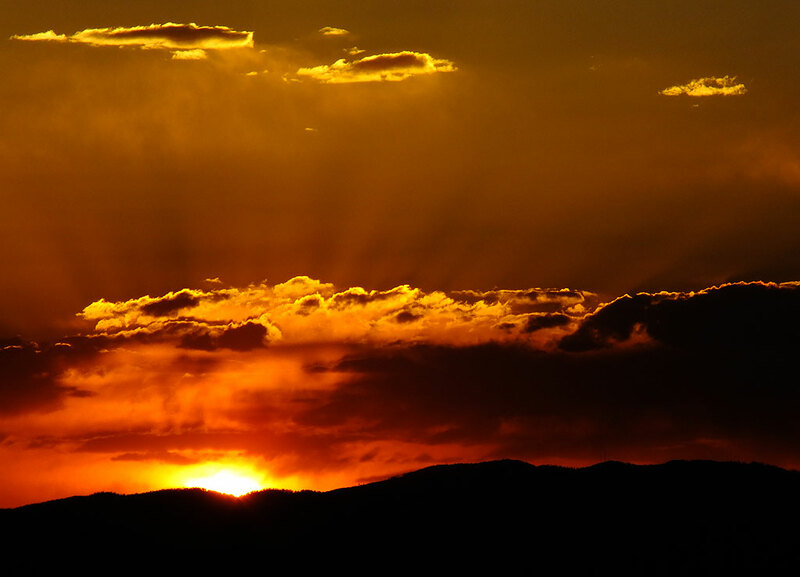 The sunset sets over central New Mexico.